Cocaine exhibits prominent abuse liability, and chronic abuse can result in cocaine use disorder with significant morbidity. Major advances have been made in delineating neurobiological mechanisms of cocaine abuse; however, effective medications to treat cocaine use disorder remain to be discovered. The present review will focus on the role of serotonin (5-HT; 5-hydroxytryptamine) neurotransmission in the neuropharmacology of cocaine and related abused stimulants. Extensive research suggests that the primary contribution of 5-HT to cocaine addiction is a consequence of interactions with dopamine (DA) neurotransmission. The literature on the neurobiological and behavioral effects of cocaine is well developed, so the focus of the review will be on cocaine with inferences made about other monoamine uptake inhibitors and releasers based on mechanistic considerations. 5-HT receptors are widely expressed throughout the brain, and several different 5-HT receptor subtypes have been implicated in mediating the effects of endogenous 5-HT on DA. However, the 5-HT2A and 5-HT2C receptors in particular have been implicated as likely candidates for mediating the influence of 5-HT in cocaine abuse as well as to traits (e.g., impulsivity) that contribute to the development of cocaine use disorder and relapse in humans. Lastly, new approaches are proposed to guide targeted development of serotonergic ligands for the treatment of cocaine use disorder. Central nervous system (CNS) stimulants are a diverse group of pharmacological agents that evoke behavioral and psychologic stimulation and alertness, energy, euphoria, and mood elevation. These compounds include naturally occurring stimulant alkaloids derived from plants (e.g., cocaine, nicotine) and synthetic molecules (e.g., amphetamine, methamphetamine, 3,4-methylenedioxymethamphetamine). Psychostimulants have important therapeutic utility in a large population for which they are essential. For example, amphetamine congeners and mixtures are employed to normalize attention deficit disorders and treat narcolepsy (Koob and Volkow, 2010), while cocaine is used for nasal and eye surgeries when indicated (Foley, 2005). Although these compounds differ in potency, duration of action, and preferred routes of administration, this broad range of psychostimulant molecules exhibits prominent abuse liability, and chronic abuse can result in substance use disorders with significant morbidity, potential mortality, and reductions in the quality of life for users and their families. Substantial advances have been made in delineating overlapping and distinct mechanisms of action of psychostimulants and uncovering neurobiological mechanisms of abuse liability (Kalivas and Volkow, 2005; Ducci and Goldman, 2012); however, effective and accessible medications to enhance recovery and to promote long-term abstinence from stimulant use disorders remain to be discovered. Although previous reviews have considered how serotonin (5-hydroxytrytamine; 5-HT) neurotransmission contributes to the abuse-related effects of cocaine, we will review relevant research that suggests that the 5-HT contribution to cocaine addiction is a consequence of 5-HT2A and 5-HT2C receptor interactions with dopamine (DA) neurotransmission that is known to be critical in the rewarding properties of abused drugs (Ritz et al., 1987; Woolverton and Kleven, 1988). Moreover, cortical dysregulation of 5-HT2A and 5-HT2C receptor function will be shown to be critical in the development of cocaine use disorder, providing a unique target for cocaine medications. The literature on the biologic and behavioral effects of cocaine is the best developed, so the focus of the data review component will necessarily use observations made for cocaine and make inferences about other monoamine uptake inhibitors and releasers based on mechanisticconsiderations. Lastly, new approaches to the development of targeted serotonergic ligands for treatment of cocaine use disorder are proposed. The morbidity and mortality associated with the illicit use of cocaine remains an alarming global problem. The World Drug Report 2013 published by the United Nations Office of Drugs and Crime estimates that cocaine use affects about 17 million people (0.4% of the global population aged 15–64 years), whereas amphetamine-type stimulants are used by an estimated 38 million people (0.7% of the global population aged 15–64 years) (http://www.unodc.org/documents/data-and-analysis/WDR2012/WDR_2012_web_small.pdf). Approximately 50% of the four million drug-related emergency department visits in the US in 2010 involved illicit drug use, and cocaine was cited as the abused drug most commonly involved. A recent investigation by the US Department of Health and Human Services identified 663,000 admitted users seeking medical treatment, which is still a minority of cocaine abusers (National Survey of Substance Abuse Treatment Services (N-SSATS): 2011 Data on Substance Abuse Treatment Facilities, http://www.samhsa.gov/data/substance-abuse-facilities-data-nssats/reports). Detoxification facilities reported that 60% of their patients were treated for cocaine abuse disorders in 2011, whereas cocaine was the primary substance of abuse reported by 8% of all treatment admissions (http://www.samhsa.gov/data/substance-abuse-facilities-data-nssats/reports). However, although treatment decreases morbidity and mortality associated with this disorder, only ∼11% of those who needed treatment received care in 2009 (http://www.casacolumbia.org/addiction-research/reports/addiction-medicine). Therapeutic approaches to relapse prevention emphasize enhancing cognitive-behavioral skills and coping responses (Hendershot et al., 2011), and antirelapse medications have proven useful adjuncts to cognitive-behavioral therapy for opioid (heroin, morphine) and alcohol addiction. However, although nicotine replacement, buproprion, and varenicline are effective therapeutics for smoking cessation, sustained medication development efforts are necessary to yield efficacious pharmacotherapies for cocaine and other abused stimulants. The pleasant subjective effects that characterize cocaine “intoxication” include euphoria, mood elevation, enhanced feelings of well-being, and mental stimulation (Cunningham, 2010). With escalating doses and patterns of repeated use, the nature of the stimulant experience changes with these effects transitioning to negative or aversive effects for some users. The Diagnostic and Statistical Manual of Mental Disorders-5 (American Psychiatric Association, 2013) now defines stimulant use disorders based upon 11 symptoms (e.g., craving, unsuccessful efforts to control use, etc.) on a continuum from mild (2–3 symptoms) to moderate (4–5 symptoms) to severe (6 or more) (Hasin et al., 2013). The diagnosis of cocaine use disorder is typically confirmed with urinalysis positive for the metabolite of cocaine benzoylecgonine, but there are no biomarkers that specifically identify the stage of progression of the use disorder nor predict the success of a given therapeutic modality (Bough et al., 2014). Cocaine use disorder can be regarded to transition from initial use to active abuse with escalating and sustained dependence emergent in vulnerable individuals. The hallmarks are compulsive drug taking and drug seeking to the exclusion of other important life activities (American Psychiatric Association, 2013). Although patients cite many behavioral reasons for using cocaine, the alternating drive to experience the euphoria and to respond to the feeling state of craving are primary determinants of continued abuse to form a cycle of addiction that becomes increasingly entrenched and uncontrollable. In particular, rapid progression is particularly common with the smoked, freebase forms of cocaine, such as “crack,” probably because the intrapulmonary route results in virtually immediate delivery of a bolus of the drug to the brain (Gorelick, 1998). Because cocaine can dramatically influence the function of brain reward and cognitive centers, cocaine use disorder can take on the strength and characteristics of a primary survival drive. The inability of patients to control cocaine use illustrates the shifted power of drug reward and conditioned drug stimuli over behavior, overriding cognitive inhibitory control mechanisms, and partially explaining the relapsing nature of dependence on cocaine (Kalivas and Volkow, 2005; Koob and Volkow, 2010; Ducci and Goldman, 2012). The last decades have witnessed increasingly sophisticated perspectives on addiction as a chronic, relapsing brain disorder that engages reward function and an "expanding cycle of dysfunction" in cognition, learning, and emotion (Koob and Volkow, 2010). This trajectory from drug use to addiction begins against a background of vulnerability based upon genetic and environmental factors and progresses as neuronal plasticity in key brain circuits promotes addictive behaviors. Much progress has been made in delineating the individual role of these factors in addictive processes based upon preclinical and clinical studies; the clear mandate now is to integrate successfully findings and chart new directions for research and treatment. The escalation from drug use to drug addiction is also linked to pathophysiology that develops during chronic drug exposure composed of a myriad of neuroadaptations that alter normal homeostasis. Some of these neuroadaptations underlie the evolution of strong associations between environmental cues and the drug-taking experience as well as emerging psychiatric complications. During abstinence from drug use, another phase of addiction is manifest as withdrawal; poor impulse control and reactivity to drug-associated environmental cues (“cue reactivity”) challenge the best intentions of the addict to remain abstinent. Major advances in understanding the neurobiology of addiction have been generated over the last 25 years, revealing the complex biologic processes that trigger and sustain addictive behavior and the physiologic ramifications of chronic exposure to abused drugs. However, this research has yet to be brought to fruition in terms of generating effective and accessible new diagnostic and pharmacotherapeutic approaches for the treatment of cocaine addiction. The demand for treatment of stimulant use disorders is high (http://www.samhsa.gov/data/substance-abuse-facilities-data-nssats/reports). Treatment can be costly or inaccessible in some regions, and the growing impact of stimulant dependence requires new approaches. The use of medications in addiction therapy is a concept that is gaining acceptance, but one which is counter to the normative belief in the treatment field that it is inappropriate to treat drug addiction with a medication (i.e., another drug). However, personalized treatment strategies for addiction might include a medication and/or a combination of medications at important stages in detoxification and recovery to reduce craving and assist in establishing a drug-free state and a window to allow cognitive restructuring and enhanced inhibitory control of drug seeking. These medications would not serve as a stand-alone “alternative” mode of therapy but rather as an “adjunctive” mode of therapy in combination with behavioral or cognitive approaches to achieving the goals of therapy. To date, pharmacological sciences have provided a limited number of Food and Drug Administration (FDA)–approved medications for the maintenance of abstinence and reduction of craving. This medication armamentarium includes medications for the treatment of alcohol (disulfiram, naltrexone, acamprosate), opiate (methadone, buprenorphine, naltrexone), and nicotine (buproprion, varenicline) addiction but not for treatment of cocaine use disorder. Efficacy of such medications would be evidenced by decreased drug use and use-related risks, improved physiologic and psychologic indices, and enhanced patient acceptance of and compliance in treatment protocols that included behavioral therapies. The development of effective approaches to treatment of cocaine addiction relies on well designed clinical research in drug-using subjects as well as preclinical research in which rigorous experimental control and specific behavioral and pharmacological manipulations can be undertaken to model and control the progression of drug exposure across time. Animal models have greatly enhanced our understanding of the neurobiology of the rewarding, reinforcing, and conditioned effects of stimulants best described for cocaine (Weiss and Koob, 2001; Kalivas and McFarland, 2003; Bubar and Cunningham, 2006). These preclinical advances originally focused the field on the DA neurotransmitter system as a relevant target for medications development for cocaine abuse. Clinical trials have not yet identified DA-based medications that lack abuse liability yet exhibit efficacy to enhance abstinence, reduce craving, and prevent relapse. Investigations have now broadened the search to explore other neural systems that play equally important roles in addictive processes, and the results have generated interesting new prospects for pharmacotherapy (Kalivas and Volkow, 2011; Skolnick and Volkow, 2012; Cunningham and Anastasio, 2014; Howell and Negus, 2014). We propose that an opportunity exists to advance toward the goal of accessible, effective pharmacotherapies for cocaine addiction by targeting 5-HT neurotransmission that may result in beneficial downstream outcomes via DA function. Drugs of abuse produce their neurobiological effects often through several mechanisms of action, only some of which are likely to promote abuse disorders. For example, cocaine acts as both a local anesthetic and a nonselective monoamine uptake inhibitor and evokes cardiovascular and neurobiological effects, but only a subset of neurobiological effects is thought to contribute to cocaine use disorder (Johanson and Fischman, 1989; Fleming et al., 1990; Catterall and Mackie, 2005; O'Brien, 2006). A primary challenge for preclinical medications development is to identify those abuse-related effects that may serve as reasonable targets for intervention with medications to enhance recovery and maintain abstinence. Two behavioral assays that exhibit validity for this purpose are drug discrimination and drug self-administration, which are profiled briefly here. In drug discrimination procedures, the drug serves as the discriminative stimulus (“interoceptive cue”) (Colpaert, 1999; Glennon and Young, 2011). The stimulus effects of psychoactive drugs in animals have proven to be useful to model the subjective effects of cocaine and other drugs of abuse as described in humans. Typically, subjects have access to two response levers, and responding on the levers produces food (or water) reinforcement contingent on the presence or absence of a training drug. Specifically, responding on only one lever (the drug-appropriate lever) results in the delivery of the reinforcer after drug pretreatment, and responding only on the other lever (the vehicle-appropriate lever) results in reinforcer delivery after vehicle pretreatment. A drug is considered to function as a discriminative stimulus if subjects can be trained to respond differentially to the presence or absence of the drug. All drugs of abuse can function as discriminative stimuli, and abuse liability of a test drug is indicated if it shares discriminative stimulus effects with a known drug of abuse (Overton, 1987; Ator and Griffiths, 2003). In addition, the discriminative stimulus effects of drugs in animals are homologous to the subjective drug effects in humans in whom discrimination is evidenced by different patterns of verbal behavior rather than by differential lever-pressing behavior (Schuster and Johanson, 1988; Carter and Griffiths, 2009). In view of these considerations, discriminative stimulus effects can be considered as a category of abuse-related drug effects. Drug discrimination can be performed in many species and provides a whole organism level of analysis that has been effectively applied to classify CNS drugs, to disentangle molecular mechanisms of psychoactive drug action, to explore the abuse liability of emerging street drugs, and to serve as an effective tool in drug discovery (Glennon and Young, 2011). Although the discriminative stimulus properties of a psychoactive drug are intimately linked with its reinforcing effects (Appel and Cunningham, 1986; Bergman et al., 2000; Huskinson et al., 2014; Teuns et al., 2014), drug discrimination does not provide a direct measure of whether a compound will act as a reinforcer to support drug self-administration. On the other hand, given the extraordinary pharmacological specificity of the stimulus properties of a drug, this assay provides a useful tool in drug discovery research focused on characterizing novel compounds in relation to those with known pharmacology (Glennon and Young, 2011). The animal model with the clearest validity for human drug taking is drug self-administration, because high concordance exists between drugs that are self-administered by nonhuman subjects and those abused by humans (Gardner, 2000). In drug self-administration procedures, drug delivery serves as the reinforcing event consequent to an operant response. In the presence of a discriminative stimulus (e.g., a stimulus light), a response (e.g., pressing a response lever) produces delivery of a drug dose. Typically, the drug dose is delivered intravenously through a chronic indwelling catheter, although methods to self-deliver drug via oral and inhalation routes are also employed. A drug is considered to function as a reinforcer if some dose of the drug maintains higher response rates than vehicle. Many drugs of abuse, including cocaine, function as reinforcers in drug self-administration procedures. The high concordance between preclinical measures of drug reinforcement and clinical measures of abuse liability has resulted in the use of drug self-administration protocols for abuse liability assessment of emerging abused drugs by regulatory agencies such as the US Drug Enforcement Agency (Ator and Griffiths, 2003; Carter and Griffiths, 2009). The support of operant responding in drug self-administration assays is often viewed as the most significant abuse-related effect amenable to preclinical study. Importantly, candidate medications can be evaluated for the degree to which they reduce self-administration of a target drug of abuse, such as cocaine (Mello and Negus, 1996; Comer et al., 2008; Haney and Spealman, 2008). That said, as with all relevant animal preclinical models, the outcomes are affected by the species, strain, and experimental history of the subjects employed in self-administration studies, and thus, interpretations must be made in the context of available knowledge from multiple in vivo assays. The employment of the drug self-administration assay has been central for the successful development of therapeutics for substance use disorders. For example, the preclinical efficacy of varenicline and buprenorphine in self-administration studies supported its development for smoking cessation and opiate use disorders (Rollema et al., 2007; Pierce et al., 2012), respectively. For cocaine and other stimulant use disorders, however, the quest to identify pharmacotherapeutics is challenged because we lack effective medications to serve as reference compounds. As a general rule, the strength of preclinical evidence for medication efficacy depends in part on the breadth of conditions across which a medication reduces drug self-administration. Medication effects on self-administration may vary as a function of multiple contributing variables, including the drug dose, the schedule of reinforcement, and the duration of daily sessions employed to establish stable self-administration. The most common variant in medications development studies is the evaluation of active drug self-administration under experimental manipulations that allow deductions about the impact of a novel medication on the reinforcing effects of the self-administered drug. The dose-response curve for cocaine typically is an inverted-U with an ascending and descending limb (Mello and Negus, 1996; LeSage et al., 1999). Any interpretation of reduced drug intake in the absence of a whole dose-response curve could be misleading, because the rate of responding at a given dose provides only a partial evaluation (typically of the descending limb) of the dose-effect curve and hence can be an ambiguous measure of the reinforcing effects of a drug. A drug pretreatment can shift the dose-effect curve to the left, right, or downward; in the case of a left- or rightward shift, it is important to realize that the potency of cocaine may be altered, but some dose of cocaine may still maintain self-administration (Mello and Negus, 1996). A potential medication that shifts the dose-effect curve for cocaine downward may have the greatest clinical utility, whereas a drug that increases self-administration is unlikely to have a desirable clinical outcome. An important consideration in the employment of self-administration for medications development is the "specificity" of effects seen with a candidate medication. Medications should reduce consumption of the abused drug without producing undesirable effects. Toxicology screens play a key role in safety assessment with additional important safety information derived from comparing medication effects on drug self-administration with effects on responding maintained by a nondrug reinforce, such as food. Thus, an additional level of safety is implied by a profile of medication effects that includes a preferential reduction in drug self-administration with lesser effects on motility and responding maintained by another reinforcer. To achieve the highest positive predictive value, medication development studies attempt to adhere to dose ranges of medication candidates that are noted to impact operant responding for a drug but minimize the likelihood of altering general behavior (e.g., motor activity, food self-administration). 3. Cue Reactivity and Reinstatement. Suppression of drug self-administration is an obvious target for antiaddiction medications. A complimentary target for medications development is suppression of reactivity to cues associated with drug use (“cue reactivity”) (Weiss, 2010). With a history of drug use, environmental contexts and internal/external stimuli become reliably associated with drug use, leading to durable conditioned responses. In humans, exposure to drug-conditioned cues produces attentional orienting toward the drug cue, physiologic arousal, and subjective craving (Carter and Tiffany, 1999; Field and Cox, 2008; Koob and Volkow, 2010), effects that are implicated in maintenance of drug use and drug-seeking during abstinence. Recently, drug cue-evoked brain activation was reported to be predictive of treatment outcome in subjects with cocaine use disorder (Marhe et al., 2013) and has been related to treatment outcome in a voucher-incentive program (Carpenter et al., 2012). These and other emergent findings (Moeller et al., 2012; Goudriaan et al., 2013) suggest that cue-evoked activation patterns seen on functional magnetic resonance imaging may be useful pharmacodynamic and/or predictive biomarkers in medications development studies (Bough et al., 2014). The term “cue reactivity” generally designates the sensitivity to drug-associated stimuli conditioned to the drug-taking experience, which can be analyzed as a behavioral construct in humans or animals. There is no consensus as to the operational definition of cue reactivity in experimental studies nor as to the protocols that provide the most translational applicability to the human situation. In humans, the attentional bias or orientation toward drug-associated cues (“cue reactivity”) is measurable as appetitive approach behaviors via a wide range of paradigms, such as the drug-word Stroop task (Cox et al., 2006). In such tasks, cue reactivity is measured as attentional bias (attentional orienting response) in this widely used implicit task in which words printed in color are presented and subjects are asked to discriminate the color of each stimulus; the subject is instructed to ignore the meaning of the words and concentrate only on responding to the color in which the word is written. The stimuli presented include neutral words and words that are related to the concerns or pathology under study, and slowness in responding to a color suggests distraction from color discrimination due to attention being biased by the meaning of the stimulus word (i.e., “cocaine” or “dealer”) (Cox et al., 2006). This task measures interference for addiction-related stimuli that is calculated as the difference between performance in the presence of substance-related distractors and performance in the presence of neutral distractors. Cue reactivity is assessed in animals as attentional bias (attentional orienting response) by measuring the learned behavioral output (“drug-seeking”) within the drug-taking context and/or in the presence of discrete drug-associated cues in animals trained on drug self-administration. Acquisition and maintenance of cocaine self-administration are typically accompanied by a period of repeated extinction training followed by the opportunity to emit a learned response (e.g., lever press) that is no longer reinforced by drug or drug-associated cues; such assays are termed “extinction/reinstatement models.” Reinstatement procedures comprise a subtype of drug self-administration that adds a focus on noncontingent delivery of stimuli (Shaham et al., 2003). In a typical example, nondrug stimuli (e.g., stimulus lights or infusion pump sounds) are paired with drug delivery such that they come to function as conditioned reinforcers. Once drug self-administration is established, modified sessions are conducted during which the operant manipulandum is present but drug reinforcement, and often nondrug stimuli, is omitted. An alternative is to employ a self-administration assay followed by assessment of cue reactivity during an imposed withdrawal period (forced abstinence) (Fuchs et al., 1998; Grimm et al., 2001; Panlilio and Goldberg, 2007; Anastasio et al., 2014a,b). This produces a decline in rates of the operant behavior that produced drug, either because drug and nondrug stimuli have been omitted and operant behavior extinguishes or because whole sessions are omitted and the operant behavior is not possible. At the conclusion of the extinction or abstinence period, test stimuli are introduced and rates of operant responding are re-evaluated, usually with continued omission of drug reinforcement. In general, three types of test stimuli are used: 1) noncontingent treatments with the self-administered drug, 2) reintroduction of drug-associated stimuli (often referred to as “cues”), and 3) stimuli such as foot shock intended to induce “stress.” Each of these stimuli can increase (reinstate) rates of operant responding after extinction. The primary goal in the use of reinstatement procedures is to model the phenomenon of relapse in drug addiction, and by extension, medication effects on reinstatement are often interpreted as predictive of their utility to treat relapse (Epstein et al., 2006; Martin-Fardon and Weiss, 2013; but see Katz and Higgins, 2003). Serotonin plays a critical role in processes that occur throughout the life span, including motor function, cognition, mood, adaptation to stressors, growth and repair, neurogenesis, and learning and memory (Lucki, 1998). The influence of 5-HT begins during development at a time when the brain is particularly sensitive to early life events known to trigger plasticity of 5-HT systems (Mitchell et al., 1990; Smythe et al., 1994; Garoflos et al., 2005; Cunningham and Anastasio, 2014). Furthermore, serotonergic stimulation is one of the first steps in encoding of short- and long-term memory at the level of the synapse (Pittenger and Kandel, 1998; Kandel, 2005). Dysfunction of the 5-HT system has major implications; malfunction of central 5-HT function is thought to contribute to a myriad of disorders, including addiction, autism, depression, obesity, and schizophrenia, with selective 5-HT reuptake inhibitors having made a significant impact in psychiatric medicine. Selective serotonin reuptake inhibitors bind to the serotonin transporter (SERT) and control presynaptic uptake of synaptic 5-HT that is released from terminals originating in the dorsal (DRN) and medial raphe nuclei, regions that provide afferent input to the limbic cortical-ventral striatopallidal circuit (Kosofsky and Molliver, 1987; Vertes, 2008). Two serotonergic pathways innervate cortical and subcortical structures with fine fibers originating from DRN 5-HT neurons and beaded fibers from medial raphe nuclei 5-HT neurons (Mamounas et al., 1991). A new phase in understanding the role of 5-HT in the brain was prompted with the discovery that the synthetic enzyme for 5-HT in brain (tryptophan hydroxylase-2) is structurally distinct from that in peripheral tissues (tryptophan hydroxylase-1) (Walther and Bader, 2003). Thus, 5-HT exhibits distinctive properties that are mirrored in the structure and function of its receptor proteins. The actions of 5-HT are mediated by 14 genetically encoded subtypes of 5-HT receptors (5-HTXR), which are grouped into seven families (5-HT1R to 5-HT7R) according to their structural and functional characteristics (for reviews, see Bockaert et al., 2006, and Hannon and Hoyer, 2008). Note the binding affinity of 5-HT can differ markedly depending on the 5-HT receptor subtype (Table 1). The 5-HT receptor family is composed of 13 G protein–coupled receptors (GPCRs) encoded by distinct genes and one ligand gated ion channel (5-HT3R) encoded by three genes (HTR3A, HTR3B, HTR3C). Each family of 5-HT GPCRs is distinguished by its principal G protein partner. The 5-HT1R (5-HT1AR, 5-HT1BR, 5-HT1DR, 5-HT1ER, 5-HT1FR) couples to Gαi/o, the 5-HT2R (5-HT2AR, 5-HT2BR, 5-HT2CR) to Gαq/11, the 5-HT4R, 5-HT6R, and 5-HT7R couple to Gαs, whereas 5-HT5AR couples to Gαi/o; the specific G protein isoform(s) that couples to 5-HT5BR is unknown. One of these GPCRs, the 5-HT2CR, is the only G protein–coupled receptor known to undergo pre-RNA editing such that the 5-HT2CR can exist in 32 predicted mRNA isoforms that could encode up to 24 different receptor protein isoforms in human brain (Gurevich et al., 2002). Coupled with the constitutive activity for some 5-HT receptors (e.g., 5-HT1R and 5-HT2R families) (Berg et al., 2008; Carrel et al., 2011) and their desensitization/resensitization processes, a complex regulatory landscape exists for the 5-HT system (Bockaert et al., 2006; Hannon and Hoyer, 2008). As these processes are better understood, the mechanistic basis of serotonergic function and its tonic and phasic control over the limbic-corticostriatal circuit will become more evident. The focus of the present review is two members of the 5-HT2R family, 5-HT2AR and 5-HT2CR, given the extensive body of literature that demonstrates involvement of neurotransmission through these GPCRs in the abuse-related effects of cocaine. The third member of the 5-HT2R family, the 5-HT2BR, is expressed primarily in the periphery with a limited localization to the CNS (Kursar et al., 1994). The 5-HT2BR is believed to play a negligible role in the central effects of abused stimulants (Bankson and Cunningham, 2002; Fletcher et al., 2002; Filip et al., 2004, 2006) and will not be discussed here; however, we do note that there is recent evidence to suggest that the 5-HT2BR may exert modulatory control over the behavioral and neurochemical effects of amphetamine (Auclair et al., 2010). In addition, it should be noted that because of the peripheral actions of the 5-HT2BR, an important consideration for minimizing potential side effects when developing novel therapeutic medications for addiction is the selectivity of a ligand versus the 5-HT2BR given that chronic agonist activation at the 5-HT2BR was identified as detrimental to cardiac valves (Rothman et al., 2000). The 5-HT2AR and 5-HT2CR are structurally composed of an extracellular N-terminal domain, a hydrophobic core of seven-transmembrane α-helices that form the orthosteric binding pocket within the plasma membrane, and a cytosolic C-terminal domain (Katritch et al., 2012, 2013). Although the extracellular loops and seven-transmembrane core are involved in ligand binding, the three intracellular loops and C terminus are critical for signal transmission, trafficking, and desensitization/resensitization processes. Stimulation of either of these GPCRs results in conformational changes that trigger recruitment of heterotrimeric G proteins or other intracellular molecules (e.g., β-arrestins) that transduce signaling. Encoded by different genes, the 5-HT2AR and 5-HT2CR share a high degree of homology, overlapping pharmacological profiles, and similar second messenger signaling systems. However, the binding affinity of 5-HT at 5-HT2AR is about 100-fold lower compared with the binding affinity at 5-HT2CR (Tables 1 and 2). Upon the initial event of receptor activation by agonist, both 5-HT2AR and 5-HT2CR interact with the heterotrimeric G protein Gαq/11 to activate the enzyme phospholipase Cβ that generates intracellular second messengers inositol-1,4,5-trisphosphate and diacylglycerol, leading to increased calcium release from intracellular stores (Hannon and Hoyer, 2008; Millan et al., 2008). Both receptors also activate phospholipase A2 and generate arachidonic acid through a pertussis toxin–sensitive G protein (Felder et al., 1990) as well as phospholipase D (McGrew et al., 2002; Moya et al., 2007). The activation of phospholipase D can occur through the canonical receptor/G protein/effector signal transduction cascade via Gα12/13 (McGrew et al., 2002, 2004) but also through noncanonical signaling via direct association of ADP-ribosylation factor with the C terminus of the 5-HT2AR (Robertson et al., 2003; Barclay et al., 2011). Lastly, the 5-HT2AR and 5-HT2CR directly associate with β-arrestin2 to activate downstream signaling (Werry et al., 2006; Abbas and Roth, 2008; Labasque et al., 2008) via a G protein–independent process (Schmid et al., 2008; Schmid and Bohn, 2010). The degree to which these downstream signaling pathways are recruited varies between the receptors, both at the level of agonist-dependent (“ligand-directed signaling,” “biased agonism,” “functional selectivity”) and agonist-independent activation (“constitutive activity”) of each pathway (Berg et al., 2008). Such features are likely to distinguish the effects of the 5-HT2R subtypes and their roles in behaviors key in addictive processes. For example, constitutive activity of both 5-HT2AR and 5-HT2CR has been demonstrated in vivo and implicated in control of associative learning and DA function (Navailles et al., 2006; Berg et al., 2008; Aloyo et al., 2009; Leggio et al., 2009a,b). The 5-HT system can influence the abuse-related effects of cocaine through its direct and indirect interactions with the DA system. The raphe nuclei, which contain serotonergic cell bodies, project to key brain areas involved in drug abuse, including the ventral tegmental area (VTA), nucleus accumbens (NAc), dorsal striatum, and prefrontal cortex (PFC) (Parent et al., 1981; Halliday and Tork, 1989; Di Matteo et al., 2008). Furthermore, 5-HT neurons synapse directly onto both DA and non-DA neurons in the VTA (Herve et al., 1987), positioning them to influence the output of the VTA in a variety of ways. 5-HT modulates DA in a complex manner that depends on the 5-HT receptor subtypes involved (Hayes and Greenshaw, 2011). Selective SERT inhibitors bind and block the SERT and are currently approved to treat depression and mood disorders. When given acutely, SERT inhibitors cause an increase in 5-HT (Kreiss and Lucki, 1995; Wong et al., 1995; Clark et al., 1996; Marek et al., 2005; Qu et al., 2009) and can affect DA transmission, although the effects vary depending on brain region and particular SERT inhibitor used. For example, acute and chronic systemic administration of the SERT inhibitor fluoxetine decreased DA in the striatum (Perry and Fuller, 1992; Ichikawa and Meltzer, 1995) and NAc (Ichikawa and Meltzer, 1995) but increased DA in the PFC (Bymaster et al., 2002), whereas systemic administration of various other SERT inhibitors had no effect on DA in the PFC (Bymaster et al., 2002). In addition, both acute (Di Mascio et al., 1998) and sustained (Dremencov et al., 2009) administration of SERT inhibitors can reduce the firing and burst rate of DA cells in the VTA, which would predict reductions in DA in brain areas innervated by VTA DA neurons. 5-HT receptors are widely expressed throughout the brain, and several different 5-HT receptor types have been implicated in mediating the effects of endogenous 5-HT on DA (Bubar and Cunningham, 2006, 2008; Alex and Pehek, 2007; Di Matteo et al., 2008; Navailles and De Deurwaerdere, 2011). However, the 5-HT2AR and 5-HT2CR in particular have been implicated as likely candidates for mediating the influence of 5-HT in drug abuse (Bubar and Cunningham, 2006, 2008; Cunningham and Anastasio, 2014). The 5-HT2AR and 5-HT2CR are expressed throughout the brain with distinct but overlapping expression patterns (Pompeiano et al., 1994) and can functionally oppose each other in regulation of the DA system (Bubar and Cunningham, 2008; Cunningham and Anastasio, 2014). The regional distribution of 5-HT2AR and 5-HT2CR within the mesolimbic DA system is illustrated in Fig. 1. There is general consensus that 5-HT2AR activation stimulates and 5-HT2CR activation inhibits DA release based on pharmacological studies with selective 5-HT2AR and 5-HT2CR agonists and antagonists (Tables 1 and 2). Cellular distribution of the 5-HT2AR and 5-HT2CR within a simplified schematic representation of the mesolimbic DA system derived primarily from rodent studies. The VTA consists of dopaminergic neurons (green) that project to both NAcc and PFC and locally projecting GABAergic interneurons (gray). The PFC consists of pyramidal glutamatergic neurons (blue) that project to NAcc and VTA and locally projecting GABAergic interneurons (gray). The NAcc is comprised of medium-spiny GABAergic neurons (gray) that project to VTA and other limbic structures not shown. Detailed descriptions of subcellular receptor localization are provided in the text. Intracellular predominance of expression is visually depicted by the presence of two receptor symbols. Briefly, VTA DA cells and PFC glutamatergic neurons predominantly express 5-HT2AR, whereas VTA and PFC GABAergic interneurons predominantly express 5-HT2CR. Both receptors are expressed at similar levels within NAcc medium spiny neurons. The regional distribution of the 5-HT2AR has been described using both in situ hybridization techniques and radioligand binding assays. Across species, the 5-HT2AR is most densely localized to cortical regions, including frontal and cingulate areas that receive DA innervation from the VTA in the mesolimbic system (Pompeiano et al., 1994; Cornea-Hebert et al., 1999; Hall et al., 2000; López-Gimenez et al., 2001b; Varnas et al., 2004). Most studies indicate that these cortical 5-HT2AR are predominantly postsynaptic in nature. The 5-HT2AR appears to be localized to either the apical dendrites or somata of glutamatergic pyramidal neurons throughout the cortex and medium-spiny projection neurons within the striatum, although some evidence of localization to GABAergic interneurons exists (Santana et al., 2004). Given that glutamatergic pyramidal neurons within the PFC send efferent projections to NAc and VTA, signaling through PFC-localized postsynaptic 5-HT2AR can indirectly enhance mesolimbic DA neurotransmission. Furthermore, 5-HT2AR has been detected within the VTA, substantia nigra pars compacta (SNpc), amygdala, and striatum of rats (Cornea-Hebert et al., 1999; Nocjar et al., 2002). However, studies have elucidated considerable species differences with respect to localization in these brain regions. For example, 5-HT2AR is detected in dense “patchy” distributions throughout the rodent caudate putamen but is found at dramatically lower levels in the striatum of nonhuman primates and humans (López-Gimenez et al., 1999, 2001b; Hall et al., 2000; Varnas et al., 2004). A number of studies in rodents have investigated the subcellular localization of the 5-HT2AR within the VTA (Fig. 1). The majority of 5-HT2AR immunolabeling colocalized with tyrosine hydroxlyase, suggesting that the receptors are expressed by DA-releasing neurons, although there was some evidence for colocalization with enzymatic markers of GABA (Doherty and Pickel, 2000; Nocjar et al., 2002). Within the NAc, the 5-HT2AR protein was predominantly detected on GABAergic medium-spiny neurons (Cornea-Hebert et al., 1999). In the mesolimbic system, 5-HT2AR activation facilitates DA cell activity and DA release. In vitro work demonstrated that 5-HT increased the firing rate of VTA DA neurons and that this effect was blocked by ketanserin, a preferential 5-HT2AR antagonist (Pessia et al., 1994). Additionally, DOI [1-(2,5-dimethoxy-4-iodophenyl)-2-aminopropane], a 5-HT2A/2CR agonist, increased both VTA cell firing and DA release in vivo, which is reversed by pretreatment with M100907 [(R)-(+)-a-(2,3-dimethoxyphenyl)-1-[2-(4-fluorophenyl)ethyl]-4-pipidinemethanol], a highly selective 5-HT2AR antagonist (Bortolozzi et al., 2005). Together, these data demonstrate that the 5-HT2AR acts to facilitate VTA neuronal activity and DA release. Similarly, local perfusion of DOI into the NAc results in increases in DA that can be blocked by nonselective 5-HT2R antagonists (Bowers et al., 2000; Yan, 2000), although neither of these studies used compounds selective enough to distinguish between 5-HT2AR and 5-HT2CR. However, 5-HT2AR antagonists can reduce the increase in DA in the NAc resulting from stimulation of the DRN (De Deurwaerdere and Spampinato, 1999) as well as the increase in DA resulting from D2 antagonism (Liegeois et al., 2002). Additionally, systemic administration of DOI potentiated amphetamine-induced DA release in the NAc, an effect that was blocked by M100907 (Kuroki et al., 2003). Together, these data support the idea that 5-HT2AR in the NAc modulates stimulated DA release, although the precise mechanism is unclear because the subcellular localization of these receptors has not been fully elucidated. 5-HT2AR may also indirectly influence DA release through modulation of excitatory inputs from the PFC. Systemic or direct infusion of DOI into the PFC results in increases in local DA that can be blocked by selective 5-HT2AR antagonists (Pehek et al., 2001, 2006; Bortolozzi et al., 2005). Although 5-HT2AR has been identified on monoaminergic axons (Jakab and Goldman-Rakic, 1998; Miner et al., 2003), the most probable explanation for this is that activating 5-HT2AR on pyramidal neurons has downstream polysynaptic effects. 5-HT2AR mediates excitatory postsynaptic currents in pyramidal cells (Aghajanian and Marek, 1997) and thus may increase glutamate release. Furthermore, 5-HT2AR is present on approximately 55% of pyramidal neurons that project to the VTA (Vazquez-Borsetti et al., 2009). Both systemic and direct administration of DOI into the PFC resulted in increased firing rates and DA release in the VTA, which were blocked by M100907 (Bortolozzi et al., 2005). Furthermore, systemic DOI increased glutamate release in the VTA, which was blocked by intracortical administration of M100907 (Pehek et al., 2006). Together, these data suggest that 5-HT2AR increases pyramidal cell glutamate activity, thus increasing the stimulatory drive on the VTA and explaining the observed 5-HT2AR–stimulated increase in DA release in the PFC (Bortolozzi et al., 2005; Pehek et al., 2006). However, this polysynaptic model may have additional elements, because approximately 50% of the 5-HT2AR–expressing pyramidal neurons that synapse in the VTA also synapse in the DRN (Vazquez-Borsetti et al., 2011), which could then modify the serotonergic inputs to a broad spectrum of brain areas, including the PFC, NAc, and VTA. Although 5-HT2AR stimulation clearly facilitates DA release in the mesocorticolimbic system in areas key for addiction, 5-HT2AR antagonists have no effect on basal DA release in the PFC (Pehek et al., 2001; Bortolozzi et al., 2005), VTA (Bortolozzi et al., 2005), or NAc (Liegeois et al., 2002), suggesting that the 5-HT2AR is involved primarily in control of phasic, not tonic, DA release. In situ hybridization and radioligand binding techniques have been used to localize the 5-HT2CR mRNA and protein, respectively, within mesocorticolimbic and nigrostriatal systems. In rats, 5-HT2CR mRNA is detected at high levels in caudate putamen, nucleus accumbens, amygdala, frontal and cingulate cortices, SNpc, and VTA (Pompeiano et al., 1994). A more recent study confirmed the presence of 5-HT2CR protein in similar brain regions, suggesting a predominantly somatodendritic localization for these receptors (Clemett et al., 2000). In macaques, 5-HT2CR mRNA was detected in cortex, amygdala, VTA, and ventral aspects of the striatum including nucleus accumbens (López-Gimenez et al., 2001a). The cellular distribution of 5-HT2CR within DA systems has been investigated extensively in the rat brain (Fig. 1). The 5-HT2CR mRNA was detected in both dopaminergic and GABAergic neurons in the VTA and SNpc (Eberle-Wang et al., 1997), whereas 5-HT2CR protein was localized to both dopaminergic and GABAergic neurons in the VTA (Bubar and Cunningham, 2007) and in VTA dopaminergic neurons that project to the NAc (Bubar et al., 2011). In the human SNpc, 5-HT2CR mRNA did not colocalize with immunoreactivity for tyrosine hydroxylase, suggesting that 5-HT2CR–positive cells were not dopaminergic but likely GABAergic in nature (Pasqualetti et al., 1999). It remains unclear whether these GABAergic cells project locally or extranigrally, although evidence has suggested the existence of locally projecting GABAergic interneurons within the human SNpc (Hebb and Robertson, 2000). 5-HT2CR protein has also been predominantly detected on GABAergic interneurons within the PFC of rodents (Liu et al., 2007). Taken together, it is evident that the 5-HT2CR is situated to modulate DA signaling through diverse mechanisms, within both DA-producing mesencephalic regions as well as their terminal fields. Because patterns of mRNA expression and immunoreactivity are generally detected within the same regions, it has been suggested that these receptors are predominantly postsynaptic and somatodendritic, although there is some evidence for localization on axon terminals in a few areas. Particularly within the VTA and PFC (and possibly SNpc), the localization of 5-HT2CR to GABAergic interneurons suggests that activation of these receptors would serve to inhibit mesolimbic DA neurotransmission (Fig. 1). Indeed, in vivo neurochemical and behavioral studies have helped to elucidate the modulatory role of 5-HT2CR activity upon DA neurotransmission. As described above, the 5-HT2CR is localized within mesocorticolimbic and nigrostriatal structures, suggesting that the 5-HT2CR may directly modulate DA neurotransmission. In agreement with this hypothesis, electrophysiological and microdialysis studies have revealed that systemic administration of selective 5-HT2CR agonists decreased, whereas antagonists and inverse agonists increased basal firing rates of VTA DA neurons and subsequent DA release within the NAc (for review, see Bubar and Cunningham, 2006, 2008). The impact of the 5-HT2CR on nigrostriatal activity is less clear. For example, some studies demonstrated only a modest modulatory effect of 5-HT2CR agonists or antagonist on SNpc neuronal firing and DA release within the dorsal striatum (Di Matteo et al., 1999; Di Giovanni et al., 2000), whereas others demonstrated more pronounced effects (Di Giovanni et al., 1999; Gobert et al., 2000; De Deurwaerdere et al., 2004; Alex et al., 2005). A later study found that 5-HT2CR knockout mice had increased basal DA levels in the NAc and dorsal striatum and correlated increased tonic activity in SNpc neurons (Abdallah et al., 2009). Moreover, a recent positron emission tomography (PET) imaging study of [11C]raclopride binding in humans demonstrated that a common missense single-nucleotide change in the 5-HT2CR gene was associated with enhanced DA release in the NAc, caudate nucleus, and putamen in response to a standardized stress challenge (Mickey et al., 2012). Therefore, there is evidence that 5-HT2CR can modulate both mesolimbic and nigrostriatal DA activity. Pharmacological manipulation of 5-HT2AR function can reliably modulate stimulant-induced increases in extracellular DA. Systemic administration of the nonselective 5-HT2AR antagonist ketanserin attenuated cocaine-induced increases in DA in rats (Broderick et al., 2004). Similarly, a more selective 5-HT2AR antagonist, SR 46349B [4-((3Z)-3-(2-dimethylaminoethyl)oxyimino-3-(2-fluorophenyl)propen-1-yl)phenol hemifumarate salt], attenuated amphetamine-induced DA release in both the NAc and striatum (Porras et al., 2002; Auclair et al., 2004) as well as amphetamine-induced reductions of [11C]raclopride binding within the dorsal striatum (Egerton et al., 2008), suggesting that 5-HT2AR antagonists attenuate stimulated DA release within both the mesolimbic and nigrostriatal DA pathways. This is an area of research that has received attention recently in nonhuman primate models. For example, Murnane et al. (2013a) directly compared the role of 5-HT2AR in cocaine-induced DA overflow in the caudate nucleus and NAc in conscious rhesus monkeys. The selective 5-HT2AR antagonist, M100907, attenuated cocaine-induced DA overflow in the caudate nucleus. However, it was ineffective in attenuating cocaine-induced DA overflow in the NAc. These data suggest that important abuse-related effects of cocaine are mediated by distinct DA projection pathways that are differentially influenced by 5-HT2AR. In a separate study, Murnane et al. (2013b) found that amphetamine induced significant and dose-dependent wake-promoting effects in rhesus monkeys at doses that induced significant increases in extracellular DA in the caudate nucleus. Importantly, M100907 attenuated the effects of amphetamine on both wakefulness and DA overflow. Hence, M100907 attenuated the dopaminergic effects induced by a DA uptake inhibitor and DA releaser in the caudate nucleus at behaviorally relevant doses. Much more attention has been directed at understanding the role of 5-HT2CR function in modulating the neurochemical effects of abused stimulants. Evidence derived from rodent studies suggests that 5-HT2CR exerts a modulatory influence over cocaine-induced increases in DA within the ventral striatum. An early investigation of 5-HT2CR knockout mice found an enhancement of cocaine-induced increases in DA in the NAc but not dorsal striatum (Rocha et al., 2002). Moreover, administration of 5-HT2CR agonists inhibited, whereas 5-HT2CR antagonists enhanced cocaine-induced elevations of DA in the NAc of rats (Navailles et al., 2004, 2008). It is reasonable to speculate that 5-HT2CR activation within the VTA functionally inhibits DA release within the mesolimbic terminal regions by stimulating local GABA release onto DA releasing neurons. One would therefore postulate that the DA-increasing effects of an impulse-dependent DA transporter inhibitor such as cocaine would be attenuated by pretreatment with a 5-HT2CR agonist, because the site of action for the latter (i.e., VTA) is upstream of the primary site of action for cocaine (i.e., mesolimbic terminal regions). Consistent with this hypothesis, Navailles et al. (2008) demonstrated that intra-VTA administration of the 5-HT2CR agonist Ro 60-0175 [(2S)-1-(6-chloro-5-fluoroindol-1-yl)propan-2-amine] attenuated the DA-increasing effects of systemically administered cocaine in anesthetized rats. Additional studies employing site-directed drug injections in rats indicate that the overall inhibitory effect of the 5-HT2CR on cocaine-induced DA overflow reflects a functional balance between inhibitory and excitatory effects of separate populations of 5-HT2CR localized in the VTA, NAc, and medial PFC (mPFC) (Filip et al., 2012). For example, intra-accumbens infusion of the selective 5-HT2CR antagonist, SB 242084 [6-chloro-2,3-dihydro-5-methyl-N-[6-[(2-methyl-3-pyridinyl)oxy]-3-pyridinyl]-1H-indole-1-carboxyamide dihydrochloride hydrate], attenuated the effects of systemically administered cocaine on NAc DA (Zayara et al., 2011). In addition, intra-PFC administration of the 5-HT2CR agonist, Ro 60-0175, increased and the 5-HT2CR antagonists, SB 242084 and SB 243213 (2,3-dihydro-5-methyl-N-[6-[(2-methyl-3-pyridinyl)oxy]-3-pyridinyl]-6-(trifluoromethyl)-1H-indole-1-carboxamide), decreased cocaine-induced elevations in NAc DA (Leggio et al., 2009a,b). These results raise the intriguing possibility that 5-HT2CR can modulate the behavioral effects of cocaine via actions downstream of NAc DA release. A recent series of experiments was the first to evaluate the role of 5-HT2CR in the neurochemical effects of cocaine in nonhuman primates. Systemic administration of the 5-HT2CR agonist, Ro 60-0175, significantly attenuated cocaine-induced increases in extracellular DA in the NAc of conscious squirrel monkeys at a dose that attenuated cocaine self-administration and cocaine-induced reinstatement of previously-extinguished cocaine self-administration (Manvich et al., 2012a). Conversely, systemic administration of the selective 5-HT2CR antagonist, SB 242084, enhanced cocaine-induced increases in NAc DA at a dose that enhanced cocaine-induced reinstatement and maintained self-administration when substituted for cocaine (Manvich et al., 2012b). The latter finding is consistent with a previous study demonstrating that systemic administration of SB 242084 enhanced cocaine-induced increases in DA in the NAc in rats (Navailles et al., 2004). Interestingly, Ro 60-0175 and SB 242084 had no effect on cocaine-induced increases in extracellular DA in the caudate nucleus (Manvich et al., 2012a,b). The latter result is in accordance with several previous reports indicating that neither 5-HT2CR agonists nor antagonists are effective at modulating DA signaling within dorsal aspects of the striatum in rodents (Di Matteo et al., 1999; Di Giovanni et al., 2000; Marquis et al., 2007), although some studies have provided opposing results (Di Giovanni et al., 1999; Gobert et al., 2000; De Deurwaerdere et al., 2004; Navailles et al., 2004; Alex et al., 2005). Accordingly, in contrast to the mesolimbic DA system, the nigrostriatal pathway seems to be relatively unaffected by signaling through the 5-HT2CR in nonhuman primates, a result that is consistent with a previous receptor localization study in which 5-HT2CR mRNA was found within the VTA and NAc but not the SNpc or dorsolateral aspects of the striatum in nonhuman primates (López-Gimenez et al., 2001a). Pharmacological enhancement of 5-HT levels can be achieved in vivo via systemic administration of selective SERT inhibitors (e.g., fluoxetine) or 5-HT releasers (e.g., fenfluramine). Studies utilizing such compounds have revealed an important modulatory role for 5-HT on the behavioral effects of cocaine. For example, indirect 5-HT agonists such as SERT inhibitors or 5-HT releasers have been found to attenuate the behavioral-stimulant effects (Spealman, 1993; Howell and Byrd, 1995), reinforcing effects (Kleven and Woolverton, 1993; Glowa et al., 1997; Czoty et al., 2002; Negus et al., 2007), and reinstatement effects (Ruedi-Bettschen et al., 2010; Howell and Negus, 2014) of cocaine in nonhuman primates. Interestingly, some SERT inhibitors (e.g., fluoxetine, citalopram), which evoked saline-responding when administered alone, enhanced the discriminative stimulus effects of cocaine in both monkeys (Spealman, 1993; Schama et al., 1997) and rats (Cunningham and Callahan, 1991; Callahan and Cunningham, 1997). Although the differential mechanisms underlying these observations remain to be fully explored, further studies employing in vivo microdialysis techniques in awake squirrel monkeys revealed that the altered behavioral effects of cocaine after serotonergic pretreatments correlated with reductions in cocaine-induced DA increases within the striatum (Czoty et al., 2002). In humans, pretreatment with a selective SERT inhibitor decreases ratings of cocaine’s positive effects (Walsh et al., 1994). In contrast, lowered 5-HT activity via tryptophan depletion increases cocaine craving and cocaine-induced DA release as measured by reductions of [11C]raclopride binding with PET imaging (Cox et al., 2011). Together, these studies suggest that 5-HT can negatively modulate the abuse-related effects of cocaine. Similarly, increasing the relative potency of monoamine transporter inhibitors at the SERT compared with the DA transporter decreases their abuse-related effects in rats (Baumann et al., 2011) and nonhuman primates (Wee et al., 2005; Kimmel et al., 2009). In a series of studies conducted by different laboratories, the stimulant-like and reinforcing effects of several compounds with varying selectivity for releasing DA versus 5-HT were assessed in nonhuman primates. Compounds with high selectivity for releasing DA versus 5-HT induced behavioral-stimulant effects in squirrel monkeys (Kimmel et al., 2009) and were self-administered by rhesus monkeys (Wee et al., 2005). However, compounds with a lower ratio of DA/5-HT release maintained lower rates of self-administration (Wee et al., 2005), and a compound that showed relatively nonselective release of DA versus 5-HT did not maintain self-administration at any dose tested (Rothman et al., 2005). Additionally, decreased selectivity of DA versus 5-HT release by these compounds was associated with a reduced capacity to increase DA within the striatum (Kimmel et al., 2009), again correlating increased 5-HT signaling with reductions in their dopaminergic, stimulant-like, and reinforcing effects. These findings lend further support to the hypothesis that pharmacologically induced increases in 5-HT neurotransmission via systemic administration of 5-HT indirect agonists attenuates the behavioral effects of monoamine uptake inhibitors and releasers, including their reinforcing effectiveness, and that these effects are associated with a diminished capacity to increase DA levels in striatal regions. The 5-HT2AR has clearly been implicated in some of the abuse-related behavioral effects of cocaine (Table 3). Systemic administration of 5-HT2AR antagonists block (McMahon et al., 2001; Fletcher et al., 2002; Filip et al., 2004), whereas the 5-HT2AR agonist DOI potentiates (Filip et al., 2004) the locomotor-stimulant effects of cocaine in rats. Moreover, virally mediated overexpression of 5-HT2AR in the VTA enhances the locomotor-stimulant effects of cocaine (Herin et al., 2013). 5-HT2AR antagonists also attenuate the discriminative stimulus effects of cocaine, shifting the dose-response curve to the right (Filip et al., 2006) and blocking both cocaine-associated cue-induced and cocaine-primed reinstatement in rats (Fletcher et al., 2002; Filip, 2005; Nic Dhonnchadha et al., 2009; Pockros et al., 2011) without attenuating reinstatement induced by cues associated with food reinforcement (Nic Dhonnchadha et al., 2009). Reinstatement may be, in part, mediated through 5-HT2AR activation in the PFC, as local microinjections of M100907 attenuated cocaine cue-induced reinstatement (Pockros et al., 2011). These findings are in accordance with predicted outcomes based upon 5-HT2AR cellular localization in VTA and PFC. The results of studies in which a 5-HT2AR or 5-HT2CR ligand was administered before evaluation of cocaine abuse-related behavioral effects of cocaine assessed in rats or monkeys. “Psychomotor stimulant” effects were evaluated typically in photobeam activity monitors. The “stimulus effects of cocaine” were evaluated in a cocaine versus saline, two-lever discrimination task. In this task, “partial” refers to partial substitution of DOI in a cocaine versus saline discrimination. “Impulsive Action” refers to studies that assayed “action restraint” measures of impulsive action (see text and references). “Reward” refers to studies that evaluated effects of manipulations on intake of cocaine (reinforcing effects) and/or breakpoints (motivational effects) in a cocaine self-administration task. “Cocaine-Seeking” refers to behavioral output reinforced by contextual and/or discrete drug-associated cues during withdrawal or following repeated extinction training that occurred in the absence (“Cue”) or presence of investigator-delivered cocaine (“Cocaine”). The up and down arrows indicate an increase (↑) or decrease (↓), respectively, in the abuse-related behavioral effects of cocaine. It is important to note that administration of M100907 was ineffective in altering the ongoing self-administration of cocaine in rats (Fletcher et al., 2002; Nic Dhonnchadha et al., 2009; Pockros et al., 2011), suggesting that 5-HT2AR antagonists are ineffective in modulating the direct reinforcing effects of cocaine. Furthermore, neither 5-HT2AR agonists nor antagonists had any effect on the reward-facilitating effects of cocaine in intracranial stimulation studies (Katsidoni et al., 2011). The lack of effect of M100907 pretreatment on cocaine self-administration has been replicated in rhesus monkeys at doses that suppressed the self-administration of 3,4-methylenedioxymethamphetamine (Fantegrossi et al., 2002). A more recent study evaluated the effects of M100907 on cocaine self-administration and drug + cue-primed reinstatement in rhesus monkeys (Murnane et al., 2013b). Consistent with previous studies, M100907 significantly attenuated drug + cue-induced reinstatement but had no significant effects on the maintenance of cocaine self-administration across a range of cocaine doses. Numerous studies documented that pharmacological activation of the 5-HT2CR mimics the effects of 5-HT indirect agonists in rodent models of cocaine use and relapse (Bubar and Cunningham, 2006, 2008; Cunningham and Anastasio, 2014). Studies in rodents have reliably found that 5-HT2CR agonists attenuate, whereas antagonists enhance the behavioral effects of cocaine (Table 3). Specifically, systemic administration of 5-HT2CR agonists in rodents attenuated cocaine-induced hyperlocomotion (Grottick et al., 2000; Filip et al., 2004), the discriminative stimulus effects of cocaine (Callahan and Cunningham, 1995; Frankel and Cunningham, 2004), as well as the direct reinforcing effects of cocaine as measured by self-administration procedures (Grottick et al., 2000; Fletcher et al., 2008; Cunningham et al., 2011). Additionally, 5-HT2CR agonists reduced reinstatement induced by cocaine and cocaine-associated cues (Grottick et al., 2000; Neisewander and Acosta, 2007; Burbassi and Cervo, 2008; Fletcher et al., 2008; Cunningham et al., 2011). Intracranial microinjections of the 5-HT2CR agonist MK 212 [2-chloro-6-(1-piperazinyl)-pyrazine hydrochloride] into the prelimbic and infralimbic regions of the mPFC attenuated both cocaine- and cue-induced reinstatement (Pentkowski et al., 2010). Moreover, intracranial microinjections of the 5-HT2CR agonist WAY 161503 [8,9-dichloro-2,3,4,4a-tetrahydro-1H-pyrazino[1,2-a]quinoxalin-5(6H)-one hydrochloride] into the mPFC or NAc increased the threshold for intracranial self-stimulation and attenuated the reward-facilitating effects of cocaine in rats (Katsidoni et al., 2011). Conversely, systemic administration of 5-HT2CR antagonists exerts effects opposite to those after agonist administration, thus enhancing cocaine-induced hyperlocomotion (Fletcher et al., 2002, 2006), the discriminative stimulus effects of cocaine (Fletcher et al., 2002; Filip et al., 2006), cocaine self-administration (Fletcher et al., 2002), and cocaine-induced reinstatement (Fletcher et al., 2002). Taken together, these findings suggest that signaling through the 5-HT2CR exerts inhibitory control over cocaine-mediated behavioral effects in rodents. A study by Manvich et al. (2012a) extended these findings to nonhuman primates for the first time by demonstrating in squirrel monkeys that pretreatment with the selective 5-HT2CR agonist Ro 60-0175 insurmountably attenuated the behavioral-stimulant, reinforcing, and reinstatement effects of cocaine, each of which was reversed by pretreatment with the selective 5-HT2CR antagonist SB 242084. Furthermore, by comparing the effects of a preferential agonist, m-chlorophenylpiperazine, with those of Ro 60-0175 on nondrug-maintained operant responding, the results indicated that increased pharmacological selectivity for the 5-HT2CR confers a higher index of behavioral specificity, because Ro 60-0175 more potently altered cocaine-maintained versus nondrug-maintained behavior. In complete opposition to the behavioral effects of 5-HT2CR agonist administration, pretreatment with the selective 5-HT2CR antagonist SB 242084 induced modest behavioral-stimulant effects when administered alone, potentiated the behavioral-stimulant effects of cocaine in an additive manner, and enhanced the reinstatement effects of cocaine in squirrel monkeys (Manvich et al., 2012b). The study also evaluated whether intravenous infusions of SB 242084 would maintain responding in squirrel monkeys when substituted for cocaine in self-administration sessions. To our knowledge, these studies were the first to assess the direct reinforcing effects of a 5-HT2CR–selective antagonist in any species. Consistent with its behavioral profile as a stimulant, SB 242084 fully substituted for cocaine in all subjects tested, maintaining maximal stable rates of responding across three consecutive test sessions that were nearly identical to those maintained by the maximally effective dose of cocaine. One obvious implication from these results is that 5-HT2CR antagonists may display some degree of abuse liability in humans. However, additional studies are needed to better understand the reinforcing effects of 5-HT2CR antagonists under a variety of experimental conditions before conclusions about their reinforcing strength and abuse liability are drawn. Human studies employing functional brain imaging have begun to define the neural circuitry underlying the acute pharmacological effects of cocaine and conditioned responses to cocaine cues. Activation of the anterior cingulate has been observed in response to acute administration of cocaine and related stimulants (Breiter et al., 1997; Volkow et al., 1999) and cocaine-related environmental cues (Maas et al., 1998; Childress et al., 1999; Kilts et al., 2001; Wexler et al., 2001). Moreover, activation of the dorsolateral PFC has also been observed in response to cocaine (Kufahl et al., 2005) and cocaine cues (Grant et al., 1996; Maas et al., 1998). The dorsolateral PFC and dorsomedial PFC are activated during the performance of a variety of cognitive tasks that require working memory or goal-directed behavior (Fuster, 1997). Hence, it is apparent that the effects of cocaine and associated cues extend beyond the mesoaccumbens system to engage cortical areas underlying complex cognitive processes. Unfortunately, the role of cortical 5-HT2R function in cognition is poorly understood. This is clearly an area of investigation that could lead to novel therapeutics as adjuncts to the use of cognitive therapy in the treatment of cocaine addiction. Several early studies using PET and single photon emission computed tomography imaging documented significant cortical dysregulation associated with chronic cocaine use, including brain perfusion deficits reported to occur with high frequency (Holman et al., 1991, 1993; Volkow et al., 1991; Strickland et al., 1993; Levin et al., 1994). Local perfusion deficits have been linked closely to changes in cerebral metabolism. Measures of brain glucose metabolism with PET imaging in chronic cocaine users documented transient increases in metabolic activity in DA-associated brain regions during cocaine withdrawal (Volkow et al., 1991). Decreases in frontal brain metabolism persisted after months of detoxification. The same pattern of decreased glucose metabolism (Reivich et al., 1985) and perfusion deficits (Volkow et al., 1988) was observed in the PFC of a subset of cocaine users. Lastly, regional brain glucose metabolism has been characterized in conjunction with DA D2 receptor availability (Volkow et al., 2001). Reductions in striatal DA D2 receptors were associated with decreased metabolic activity in the orbital frontal cortex and anterior cingulate cortex in detoxified individuals. In contrast, the orbital frontal cortex was hypermetabolic in active cocaine abusers (Volkow et al., 1991). Collectively, these findings observed in cocaine abusers document significant dysregulation of DA systems that are reflected in brain metabolic changes in areas involved in reward circuitry. Recent advances in functional connectivity magnetic resonance imaging have begun to characterize circuit-level interactions between brain regions in the context of drug abuse and addiction (Ma et al., 2010; Sutherland et al., 2012). Chronic drug use is consistently associated with significant changes in functional connectivity within PFC and limbic circuitry that likely contribute to loss of control over drug use and relapse. For example, several studies have reported disruptions in frontal-striatal circuitry in cocaine users (Gu et al., 2010; Hanlon et al., 2011; Wilcox et al., 2011). Compared with control subjects, cocaine users have lower resting-state functional connectivity within the mesolimbic DA system and lower network connectivity between limbic regions is correlated with duration of cocaine use (Gu et al., 2010). Indeed, a recent review article concluded that loss of PFC function during abstinence could be the most reliable clinical biomarker of relapse (Hanlon et al., 2013; Bough et al., 2014). It is well recognized that chronic exposure to cocaine can induce significant changes in the 5-HT system that may underlie cortical dysregulation. Increases in the SERT after chronic cocaine have been reported in cells (Kittler et al., 2010), rodents (Cunningham et al., 1992), nonhuman primates (Banks et al., 2008; Gould et al., 2011), and humans (Jacobsen et al., 2000; Mash et al., 2000). Chronic self-administration of cocaine in rhesus monkeys also resulted in an upregulation of 5-HT2AR in the frontal cortex (Sawyer et al., 2012) as determined in vivo with PET imaging and the selective 5-HT2AR ligand [11C]M100907 (Fig. 2). Previous studies have suggested that withdrawal from cocaine sensitizes 5-HT2AR (Baumann and Rothman, 1996, 1998; Carrasco et al., 2006; Carrasco and Battaglia, 2007), which may contribute to relapse, particularly as antagonists at 5-HT2AR are able to block cue- and cocaine-primed reinstatement (Fletcher et al., 2002; Filip, 2005; Nic Dhonnchadha et al., 2009; Murnane et al., 2013b). It is important to note that the highest expression of 5-HT2AR in the brain is on the dendrites of layer V cortical pyramidal glutamatergic cells (Cornea-Hebert et al., 1999; Jakab and Goldman-Rakic, 2000; Miner et al., 2003). These layer V pyramidal cells are the major type of cell in the cortex that sends subcortical projections. Accordingly, the anatomic localization of 5-HT2AR provides for modulation of cortical regulation of subcortical function (Fig. 1). PET images showing in vivo distribution of binding of the 5-HT2AR selective ligand [11C]M100907 in rhesus monkey brain. Images were acquired in subject RGg-9 during a single 90-minute scan and coregistered with the animal’s structural MRI. Three representative images are shown in the coronal, horizontal, and sagittal planes (from left to right). The high density of cortical binding is clearly evident, especially the PFC. The images shown were obtained in a control subject. Note that chronic self-administration of cocaine in a group of four male rhesus monkeys over a 3.5-month period significantly increased 5-HT2AR availability in the frontal cortex (Sawyer et al., 2012). The 5-HT2AR has been linked to measures of impulsivity, a trait that is believed to contribute to both the predisposition to develop drug abuse and to drug relapse in humans (de Wit, 2009; Winstanley et al., 2010; Kirby et al., 2011; Cunningham and Anastasio, 2014). Cocaine-dependent subjects are more impulsive than nondrug using subjects (Moeller et al., 2001a,b), whereas greater impulsivity predicts reduced retention in outpatient treatment trials for cocaine use disorder (Moeller et al., 2001b, 2007; Schmitz et al., 2009). Cocaine increases measures of impulsivity in animal models using delay discounting tasks when given acutely (Dandy and Gatch, 2009; Anastasio et al., 2011) or repeatedly (Setlow et al., 2009). Furthermore, withdrawal from cocaine resulted in immediate and marked disruptions in performance on a 5-choice serial reaction time (5-CSRT) task (Winstanley et al., 2009). Therefore, trait impulsivity may contribute to the initiation of cocaine use, and cocaine use may then increase impulsivity, thus contributing to the development and maintenance of cocaine abuse and dependence as well as the risk for relapse (de Wit, 2009; Kirby et al., 2011). In additional studies, M100907 effectively reduced premature responding on the 5-CSRT task (Winstanley et al., 2003; Fletcher et al., 2007) and the one-choice serial reaction time (1-CSRT) task (Anastasio et al., 2011) in rats. Importantly, M100907 reversed cocaine-induced deficits in the 1-CSRT task (Anastasio et al., 2011) and attenuated premature responding on the 5-CSRT induced by acute administration of cocaine (Fletcher et al., 2011). Together, these studies suggest that 5-HT2AR function is important for both baseline impulsivity and drug-induced impulsive choice and that decreasing 5-HT2AR function may decrease impulsivity. Understanding the manner in which the 5-HT2AR modulates cortical function is decidedly more advanced than for 5-HT2CR, in part because selective 5-HT2AR ligands, particularly antagonists [e.g., M100907 (MDL100907)], were accessible to scientists in the 1990s, whereas selective 5-HT2CR agonists (e.g., Ro 60-0175) and antagonists (e.g., SB 242084) became commercially available only more recently. As is the case for the 5-HT2AR, the 5-HT2CR is important in establishing the excitatory/inhibitory balance in the PFC microcircuitry. The 5-HT2CR has also been linked to measures of impulsivity in preclinical studies. Global 5-HT depletion increases the number of premature responses on the 5-CSRT task, an effect that is mimicked by the 5-HT2CR antagonist SB242084 in rats (Winstanley et al., 2004). Wild-type mice treated with SB 242084 also showed diminished response inhibition in the 5-CSRT task (Pennanen et al., 2013). Importantly, the 5-HT2CR agonist Ro 60-0175 and M100907 both attenuated cocaine-induced premature responding on the 5-CSRT task, showing similar functional effects on a measure of impulsivity (Fletcher et al., 2011). A recent study used the 1-CSRT task to identify high and low impulsive phenotypes in rats (Anastasio et al., 2014b). Lower cortical 5-HT2CR membrane protein levels and an increased frequency of edited 5-HT2CR mRNA variants linked to reduced 5-HT2CR signaling capacity distinguished high impulsive rats from low impulsive rats. Genetic loss of the 5-HT2CR in the mPFC was also associated with high impulsivity. Dampened 5-HT2CR agonist sensitivity is also associated with higher cue reactivity in outbred rats (Anastasio et al., 2014a,b). In outbred rats engineered with a genetic knockdown of the 5-HT2CR in the mPFC, both impulsive action and cue reactivity were elevated over controls, suggesting that reduced 5-HT2CR tone in the mPFC confers vulnerability to these interlocked behaviors (Anastasio et al., 2014b). These data suggest that therapeutic strategies to enhance 5-HT2CR function may be useful to maximize suppression of impulsivity and cue reactivity which may enhancement control over relapse in cocaine use disorder. A comprehensive literature including clinical and preclinical studies has identified the 5-HT system as a potential source of novel pharmacotherapeutic targets for the treatment of cocaine abuse. This was a particularly exciting possibility because SERT inhibitors have been used clinically for several decades to treat a variety of psychopathologies and were known to be safe and well tolerated. Despite the overwhelming evidence suggesting that SERT inhibitors can reduce the abuse-related effects of cocaine, fluoxetine has typically failed to show reductions in cocaine abuse in clinical trials (Grabowski et al., 1995; Batki et al., 1996; Ciraulo et al., 2005; Winhusen et al., 2005), although clinical studies with more selective SERT inhibitors have shown more promise. For example, citalopram reduced cocaine use in cocaine-dependent patients (Moeller et al., 2007) and sertraline delayed relapse in recently abstinent cocaine-dependent patients (Oliveto et al., 2012). Although the reasons for the general lack of efficacy with SERT inhibitors in clinical studies remain speculative, one possible explanation is that the indirect activation of all 5-HT receptor subtypes is not an ideal pharmacotherapeutic strategy, and thus, studies have begun to explore the therapeutic potential of more specific protein targets within the 5-HT system. The studies described in the present review indicate that 5-HT2AR antagonists may be effective in preventing relapse in abstinent or treatment-seeking individuals. For instance, approximately 25% of individuals completing residential treatment programs relapse within 1–5 years and an additional 18% return to a second treatment programs within 1 year (Simpson et al., 1999, 2002). 5-HT2AR antagonist treatment, if begun during the residential phase, may aid in maintaining abstinence and preventing relapse after release, particularly if a patient is exposed to the drug or drug-associated cues. However, the preclinical studies reviewed do not suggest 5-HT2AR antagonists would be effective as an intervention for current, ongoing cocaine abuse. Although 5-HT2AR antagonists reliably attenuate both cue- and cocaine-primed reinstatement, they are ineffective in reducing maintenance of cocaine self-administration (Fletcher et al., 2002; Filip, 2005; Nic Dhonnchadha et al., 2009; Murnane et al., 2013b). Thus it appears that the direct reinforcing effects of cocaine are not dependent on 5-HT2AR, whereas other aspects of the abuse-related effects of cocaine are dependent on 5-HT2AR function. Although there are no FDA-approved medications that are selective 5-HT2AR antagonists, pimavanserin is a potent and selective 5-HT2AR antagonist (Vanover et al., 2006) that is under development for the treatment of psychosis in patients with Parkinson’s disease. The FDA noted in April 2013 that the successful pimavanserin phase III trial (Study ACP-103-020; clinicaltrials.gov) would suffice for a regulatory filing (http://www.acadia-pharm.com/pipeline/pimavanserin.htm) and submission of a new drug application is expected by the end of 2014 with potential approval in the second half of 2015. Thus, pimavanserin will be available for clinical trials for efficacy in treatment of cocaine use disorder in the near future. The studies reviewed here also indicate that a selective 5-HT2CR agonist may be therapeutically effective to prevent relapse in abstinent or treatment-seeking individuals, as suggested for a selective 5-HT2AR antagonist (above). Unlike the a 5-HT2AR antagonist, which is not expected to suppress cocaine intake, preclinical studies suggest that a 5-HT2CR agonist would reduce the subjective and reinforcing effects of cocaine if a patient is exposed to the drug during recovery (Callahan and Cunningham, 1995; Grottick et al., 2000; Frankel and Cunningham, 2004; Fletcher et al., 2008; Cunningham et al., 2011). A test of this hypothesis was not possible in humans until the recent FDA approval of the selective, high-efficacy 5-HT2CR agonist lorcaserin, which is marketed for reduction of weight in patients with a body-to-mass index of >30 or with a body mass index >27 comorbid with type-2 diabetes, hypertension, or dyslipidemia (www.us.eisai.com/). The availability of lorcaserin has already prompted the initiation of its efficacy to support smoking cessation (Arena Pharmaceuticals; clinicaltrials.gov). This review highlights the oppositional control of 5-HT2AR and 5-HT2CR ligands over the abuse-related effects of cocaine (Bubar and Cunningham, 2006, 2008; Cunningham and Anastasio, 2014). It is probably not unexpected, therefore, that nonselective 5-HT2A/2CR antagonists failed to attenuate cocaine seeking in animals (Schenk, 2000; Burmeister et al., 2004; Filip, 2005) or humans (Ehrman et al., 1996) or influence self-reported euphoric effects of cocaine (Newton et al., 2001) or craving (De La Garza et al., 2005; Loebl et al., 2008). Interestingly, there is a small degree of evidence that the net consequence of 5-HT2AR and 5-HT2CR function in mPFC is interactive; the constitutive knockout of the 5-HT2AR resulted in an upregulation of 5-HT2CR control over the excitability of mPFC pyramidal neurons (Beique et al., 2007), suggesting that the 5-HT2AR and 5-HT2CR may act in concert to control behavior. The potential therapeutic implications in cocaine use disorder are suggested by the discovery that impulsive action, cocaine intake, and cue reactivity were suppressed by very low, ineffective doses of the selective 5-HT2AR antagonist M100907 plus the selective 5-HT2CR agonist WAY 163909 [(7bR,10aR)-1,2,3,4,8,9,10,10a-octahydro-7bH-cyclopenta-[b][1,4]diazepino[6,7,1hi]indole] (Cunningham et al., 2013). The enhancement observed between the 5-HT2AR antagonist M100907 plus WAY 163909 was achieved at doses that are much lower than the doses of each ligand necessary to affect the given behavior when administered alone, suggesting that there may be combination approaches that would potentially minimize side effects of the medications. At present, there are no FDA-approved medications known to exhibit this exact pharmacological profile; however, efforts to chemically synthesize such molecules are ongoing (Booth et al., 2009; Shashack et al., 2011; Cunningham et al., 2013). Biomarkers or predictors for vulnerability to relapse will be of immense help in facilitation of treatment goals and appreciation of potential medication efficacy. Individual differences in vulnerability (such as impulsivity or cue reactivity) could be linked to genotypes that track with altered function of 5-HT2AR and/or 5-HT2CR proteins, such as single nucleotide polymorphisms (SNPs). Several SNPs in the promoter or coding regions of the genes for 5-HT2AR (HTR2A) and 5-HT2CR (HTR2C) have been shown to associate with personality traits, psychiatric conditions, and response to psychiatric medications such as atypical antipsychotics and antidepressants. Impulsivity has been associated with genotypes that predict reduced 5-HT function (Bjork et al., 2002; Bevilacqua et al., 2010; Stoltenberg et al., 2012; Bevilacqua and Goldman, 2013). The HTR2A A(-1438)G SNP was associated with response inhibition in two specific behavioral tasks in normal subjects (Nomura et al., 2006) and impulsive behavior in bulimia (Bruce et al., 2005).The HTR2A T102C SNP is associated with impulse control in cocaine-dependent subjects (Bjork et al., 2002). A SNP (rs6318) identified in the coding region of the 5-HT2CR that converts a cysteine (Cys) to a serine (Ser) at amino acid codon 23 in the N-terminal extracellular domain (Ser23 variant) (Lappalainen et al., 1995) has been implicated in the pathogenesis of psychiatric disorders (Burnet et al., 1999; Frisch et al., 2000; Serretti et al., 2000; Lerer et al., 2001). Recently, cocaine-dependent subjects carrying the Ser23 variant were shown to display significantly higher cue reactivity (Anastasio et al., 2014a). This positive association suggests that cue reactivity may be related to altered function of the variant 5-HT2CR (Okada et al., 2004; Fentress et al., 2005; Walstab et al., 2011). This may be a particularly important genotype in cocaine use disorder given that enhanced DA release in the NAc, caudate nucleus, and putamen in response to a standardized stress challenge has been linked to the Ser23 variant (Mickey et al., 2012). Thus, the identification and validation of SNPs in the HTR2A and HTR2C that predict impulsivity, cue reactivity or treatment success could also be useful in guiding prevention efforts (Ducci and Goldman, 2012). As convergent evidence links genotypes to phenotypes important in cocaine use disorder and relapse, it will be possible to understand better and predict medication efficacy and to integrate this information into more effective clinical care for afflicted patients. Although cocaine abuse is a significant public health problem, no effective pharmacotherapeutics are available to treat this disorder. Preclinical studies have clearly indicated that 5-HT plays an important role in the abuse-related effects of cocaine. Although some human laboratory studies have supported the use of SERT inhibitors for treating cocaine dependence, the preponderance of evidence does not support clinical efficacy. This likely reflects a lack of selectivity regarding interactions with specific 5-HT receptor subtypes. In particular, SERT inhibition results in indirect agonism of both the 5-HT2AR and 5-HT2CR, and these receptors have been shown to oppose each other in their modulation of the abuse-related effects of cocaine. As such, a more selective approach is likely to yield improved clinical effectiveness. Particularly strong support has been garnered showing that administration of 5-HT2AR receptor antagonists attenuates reinstatement of cocaine self-administration, a preclinical model of drug relapse in human addicts. Indeed, 5-HT2AR antagonists have been shown to oppose dopaminergic and glutamatergic neurotransmission, which are closely tied to reinstatement of cocaine self-administration. Given the increased selectivity of 5-HT2AR antagonism compared with SERT inhibition and the duality of this receptor’s effects on abuse-related neurochemical changes, it is likely that 5-HT2AR antagonists will be effective medications for cocaine dependence. In support of this contention, previous work has suggested that the clinical ineffectiveness of SERT inhibitors for treating cocaine dependence is related to the persistence of drug craving during treatment with SERT inhibitors. 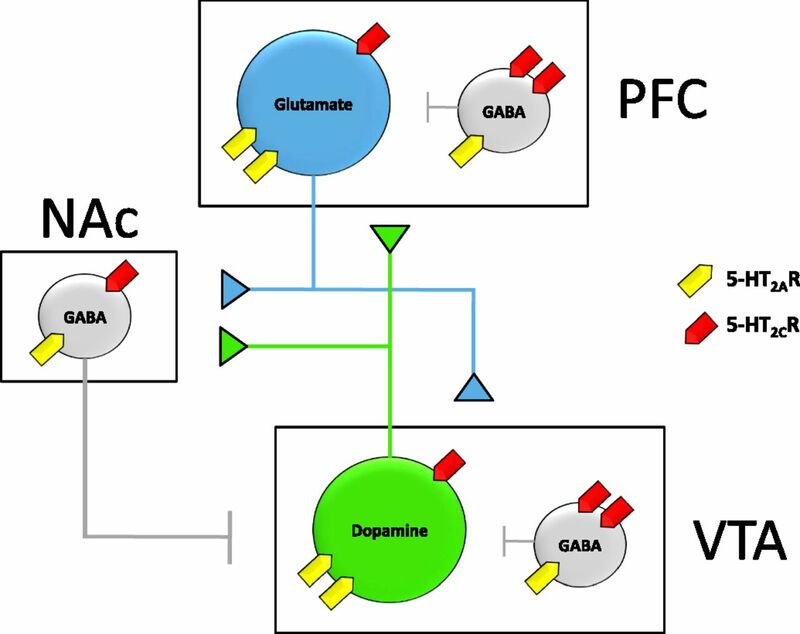 Given the established role of glutamate in drug- and cue-induced reinstatement, it is likely that 5-HT2AR antagonists, through modulation of glutamate in the PFC, will effectively reduce craving in individuals with cocaine addiction. As such, because of its selectivity and proposed clinical mechanism of action, targeting this receptor is a novel and innovative approach to treating cocaine dependence. The studies reviewed here also indicate that selective 5-HT2CR agonists may be therapeutically effective to prevent relapse in abstinent or treatment-seeking individuals. Unlike 5-HT2AR antagonists that are not expected to suppress cocaine intake, preclinical studies suggest that 5-HT2CR agonists would reduce the subjective and reinforcing effects of cocaine if a patient is exposed to the drug during recovery (Callahan and Cunningham, 1995; Grottick et al., 2000; Frankel and Cunningham, 2004; Fletcher et al., 2008; Cunningham et al., 2011). Accordingly, we propose that mixed-action compounds that act both as 5-HT2CR agonists and 5-HT2AR antagonists may be indicated during the initial phase of pharmacotherapeutic intervention. The authors thank Marian Mathis-Grant for administrative assistance with the preparation of the manuscript, and Dr. Carrie McAllister, Dr. Daniel Manvich, Daniel Curry, and Maylen Diaz for assistance with the tables and figures. Wrote or contributed to the writing of the manuscript: Howell, Cunningham. This work was supported by the National Institutes of Health National Institute on Drug Abuse [Grants K05-DA020087 (to K.A.C.) and K05-DA031246 (to L.L.H. )]; the National Institutes of Health Office of Research Infrastructure Programs/Office of the Director [Grant P51-OD11132 (to L.L.H. )]; and the Center for Addiction Research at the University of Texas Medical Branch (to K.A.C.). (2008) Arresting serotonin. Proc Natl Acad Sci USA 105:831–832. (2009) Impact of serotonin 2C receptor null mutation on physiology and behavior associated with nigrostriatal dopamine pathway function. J Neurosci 29:8156–8165. (1997) Serotonin induces excitatory postsynaptic potentials in apical dendrites of neocortical pyramidal cells. Neuropharmacology 36:589–599. (2007) Pharmacologic mechanisms of serotonergic regulation of dopamine neurotransmission. Pharmacol Ther 113:296–320. (2005) Modulation of dopamine release by striatal 5-HT2C receptors. Synapse 55:242–251. (2009) Current status of inverse agonism at serotonin2A (5-HT2A) and 5-HT2C receptors. Pharmacol Ther 121:160–173. (2013). Diagnostic and Statistical Manual of Mental Disorders, 5th Edition. American Psychiatric Publishing, Arlington, VA.
(2014a) Variation within the serotonin (5-HT) 5-HT₂C receptor system aligns with vulnerability to cocaine cue reactivity. Transl Psychiatr 4:e369. (2011) Serotonin (5-hydroxytryptamine) 5-HT(2A) receptor: association with inherent and cocaine-evoked behavioral disinhibition in rats. Behav Pharmacol 22:248–261. (2014b) Functional status of the serotonin 5-HT2C receptor (5-HT2CR) drives interlocked phenotypes that precipitate relapse-like behaviors in cocaine dependence. Neuropsychopharmacology 39:370–382. (1986) The use of drug discrimination procedures to characterize hallucinogenic drug actions. Psychopharmacol Bull 22:959–967. (2003) Principles of drug abuse liability assessment in laboratory animals. Drug Alcohol Depend 70(3, Suppl)S55–S72. (2004) Role of serotonin 2A receptors in the D-amphetamine-induced release of dopamine: comparison with previous data on alpha1b-adrenergic receptors. J Neurochem 91:318–326. (2010) The central serotonin 2B receptor: a new pharmacological target to modulate the mesoaccumbens dopaminergic pathway activity. J Neurochem 114:1323–1332. (2008) Effects of cocaine and MDMA self-administration on serotonin transporter availability in monkeys. Neuropsychopharmacology 33:219–225. (2002) Pharmacological studies of the acute effects of (+)-3,4-methylenedioxymethamphetamine on locomotor activity: role of 5-HT(1B/1D) and 5-HT(2) receptors. Neuropsychopharmacology 26:40–52. (2011) 5-HT2A receptor signalling through phospholipase D1 associated with its C-terminal tail. Biochem J 436:651–660. (1996) A controlled trial of fluoxetine in crack cocaine dependence. Drug Alcohol Depend 41:137–142. (2011) In vivo effects of amphetamine analogs reveal evidence for serotonergic inhibition of mesolimbic dopamine transmission in the rat. J Pharmacol Exp Ther 337:218–225. (1996) Chronic cocaine exposure potentiates prolactin and head shake responses to 5-HT2 receptor stimulation in rats. Neuropharmacology 35:295–301. (1998) Alterations in serotonergic responsiveness during cocaine withdrawal in rats: similarities to major depression in humans. Biol Psychiatry 44:578–591. (2007) Mechanism of the 5-hydroxytryptamine 2A receptor-mediated facilitation of synaptic activity in prefrontal cortex. Proc Natl Acad Sci USA 104:9870–9875. (2008) Physiological and therapeutic relevance of constitutive activity of 5-HT 2A and 5-HT 2C receptors for the treatment of depression. Prog Brain Res 172:287–305. (2000) Agonist efficacy, drug dependence, and medications development: preclinical evaluation of opioid, dopaminergic, and GABAA-ergic ligands. Psychopharmacology (Berl) 153:67–84. (2010) A population-specific HTR2B stop codon predisposes to severe impulsivity. Nature 468:1061–1066. (2013) Genetics of impulsive behaviour. Philos Trans R Soc Lond B Biol Sci 368:20120380. (2002) Serotonin 2a receptor T102C polymorphism and impaired impulse control. Am J Med Genet 114:336–339. (2005) Evaluation of DOI, 8-OH-DPAT, eticlopride and amphetamine on impulsive responding in a reaction time task in rats. Behav Pharmacol 16:93–100. (2006) Neuronal 5-HT metabotropic receptors: fine-tuning of their structure, signaling, and roles in synaptic modulation. Cell Tissue Res 326:553–572. (2009) (1R, 3S)-(-)-trans-PAT: a novel full-efficacy serotonin 5-HT2C receptor agonist with 5-HT2A and 5-HT2B receptor inverse agonist/antagonist activity. Eur J Pharmacol 615:1–9. (2005) The activation of 5-HT receptors in prefrontal cortex enhances dopaminergic activity. J Neurochem 95:1597–1607. (2014) Biomarkers for the development of new medications for cocaine dependence. Neuropsychopharmacology 39:202–219. (2000) Serotonin 5-HT(2) receptor stimulation of dopamine release in the posterior but not anterior nucleus accumbens of the rat. J Neurochem 75:1625–1633. (2004) Cocaine acts on accumbens monoamines and locomotor behavior via a 5-HT2A/2C receptor mechanism as shown by ketanserin: 24-h follow-up studies. Prog Neuropsychopharmacol Biol Psychiatry 28:547–557. (2000) Biarylcarbamoylindolines are novel and selective 5-HT(2C) receptor inverse agonists: identification of 5-methyl-1-[[2-[(2-methyl-3-pyridyl)oxy]- 5-pyridyl]carbamoyl]-6-trifluoromethylindoline (SB-243213) as a potential antidepressant/anxiolytic agent. J Med Chem 43:1123–1134. (2005) Association of the promoter polymorphism -1438G/A of the 5-HT2A receptor gene with behavioral impulsiveness and serotonin function in women with bulimia nervosa. Am J Med Genet B Neuropsychiatr Genet 137B:40–44. (2006) Serotonin 5-HT2A and 5-HT2C receptors as potential targets for modulation of psychostimulant use and dependence. Curr Top Med Chem 6:1971–1985. (2007) Distribution of serotonin 5-HT2C receptors in the ventral tegmental area. Neuroscience 146:286–297. (2008) Prospects for serotonin 5-HT2R pharmacotherapy in psychostimulant abuse. Prog Brain Res 172:319–346. (2011) 5-HT(2C) receptors localize to dopamine and GABA neurons in the rat mesoaccumbens pathway. PLoS ONE 6:e20508. (2008) Stimulation of serotonin2C receptors influences cocaine-seeking behavior in response to drug-associated stimuli in rats. Psychopharmacology (Berl) 196:15–27. (2004) Differential roles of 5-HT receptor subtypes in cue and cocaine reinstatement of cocaine-seeking behavior in rats. Neuropsychopharmacology 29:660–668. (1999) Allelic variation of the 5-HT2C receptor (HTR2C) in bulimia nervosa and binge eating disorder. Psychiatr Genet 9:101–104. (2002) Fluoxetine, but not other selective serotonin uptake inhibitors, increases norepinephrine and dopamine extracellular levels in prefrontal cortex. Psychopharmacology (Berl) 160:353–361. (1995) Modulation of the discriminative stimulus properties of cocaine by 5-HT1B and 5-HT2C receptors. J Pharmacol Exp Ther 274:1414–1424. (1997) Modulation of the discriminative stimulus properties of cocaine: comparison of the effects of fluoxetine with 5-HT1A and 5-HT1B receptor agonists. Neuropharmacology 36:373–381. (2012) Measures of attentional bias and relational responding are associated with behavioral treatment outcome for cocaine dependence. Am J Drug Alcohol Abuse 38:146–154. (2007) Withdrawal from a single exposure to cocaine increases 5-HT2A receptor and G protein function. Neuroreport 18:51–55. (2006) Cocaine-mediated supersensitivity of 5-HT2A receptors in hypothalamic paraventricular nucleus is a withdrawal-induced phenomenon. Neuroscience 143:7–13. (2011) Axonal targeting of the 5-HT1B serotonin receptor relies on structure-specific constitutive activation. Traffic 12:1501–1520. (1999) Cue-reactivity and the future of addiction research. Addiction 94:349–351. (2009) Principles of laboratory assessment of drug abuse liability and implications for clinical development. Drug Alcohol Depend 105 (Suppl 1):S14–S25. (2005) Local anesthetics, in The Pharmacological Basis of Therapeutics (Hardman JG and Limbird LE eds) pp 369–388, McGraw-Hill, New York. (1999) Limbic activation during cue-induced cocaine craving. Am J Psychiatry 156:11–18. (2005) Efficacy screening trials of paroxetine, pentoxifylline, riluzole, pramipexole and venlafaxine in cocaine dependence. Addiction 100 (Suppl 1):12–22. (1996) Effect of acute and chronic fluoxetine on extracellular dopamine levels in the caudate-putamen and nucleus accumbens of rat. Synapse 23:125–131. (2000) Immunohistochemical localisation of the 5-HT2C receptor protein in the rat CNS. Neuropharmacology 39:123–132. (1999) Drug discrimination in neurobiology. Pharmacol Biochem Behav 64:337–345. (2008) The role of human drug self-administration procedures in the development of medications. Drug Alcohol Depend 96:1–15. (2011) Effects of lowered serotonin transmission on cocaine-induced striatal dopamine response: PET [¹¹C]raclopride study in humans. Br J Psychiatry 199:391–397. (2006) The addiction-stroop test: Theoretical considerations and procedural recommendations. Psychol Bull 132:443–476. (2010) Psychostimulants, in Encyclopedia of Psychopharmacology, Vol. 2 (Ip S ed) pp 1093–1100, Springer-Verlag, Berlin. (2014). Serotonin at the nexus of impulsivity and cue reactivity in cocaine addiction. Neuropharmacology 76: 460–478. (2013) Synergism between a serotonin 5-HT2A receptor (5-HT2AR) antagonist and 5-HT2CR agonist suggests new pharmacotherapeutics for cocaine addiction. ACS Chem Neurosci 4:110–121. (1991) Monoamine reuptake inhibitors enhance the discriminative state induced by cocaine in the rat. Psychopharmacology (Berl) 104:177–180. (2011) Selective serotonin 5-HT(2C) receptor activation suppresses the reinforcing efficacy of cocaine and sucrose but differentially affects the incentive-salience value of cocaine- vs. sucrose-associated cues. Neuropharmacology 61:513–523. (1992) Chronic cocaine enhances serotonin autoregulation and serotonin uptake binding. Synapse 11:112–123. (2002) Characterization of phospholipase C activity at h5-HT2C compared with h5-HT2B receptors: influence of novel ligands upon membrane-bound levels of [3H]phosphatidylinositols. Naunyn Schmiedebergs Arch Pharmacol 365:242–252. (2002) Serotonergic attenuation of the reinforcing and neurochemical effects of cocaine in squirrel monkeys. J Pharmacol Exp Ther 300:831–837. (2009) The effects of chronic cocaine exposure on impulsivity in rats. Behav Pharmacol 20:400–405. (2004) Constitutive activity of the serotonin2C receptor inhibits in vivo dopamine release in the rat striatum and nucleus accumbens. J Neurosci 24:3235–3241. (1999) Role of serotonin(2A) and serotonin(2B/2C) receptor subtypes in the control of accumbal and striatal dopamine release elicited in vivo by dorsal raphe nucleus electrical stimulation. J Neurochem 73:1033–1042. (2005) Risperidone diminishes cocaine-induced craving. Psychopharmacology (Berl) 178:347–350. (2009) Impulsivity as a determinant and consequence of drug use: a review of underlying processes. Addict Biol 14:22–31. (1999) Selective blockade of serotonin-2C/2B receptors enhances mesolimbic and mesostriatal dopaminergic function: a combined in vivo electrophysiological and microdialysis study. Neuroscience 91:587–597. (2000) Preferential modulation of mesolimbic vs. nigrostriatal dopaminergic function by serotonin(2C/2B) receptor agonists: a combined in vivo electrophysiological and microdialysis study. Synapse 35:53–61. (1998) Selective serotonin reuptake inhibitors reduce the spontaneous activity of dopaminergic neurons in the ventral tegmental area. Brain Res Bull 46:547–554. (1999) SB 242084, a selective serotonin2C receptor antagonist, increases dopaminergic transmission in the mesolimbic system. Neuropharmacology 38:1195–1205. (2008) Serotonin control of central dopaminergic function: focus on in vivo microdialysis studies. Prog Brain Res 172:7–44. (2000) Ultrastructural localization of the serotonin 2A receptor in dopaminergic neurons in the ventral tegmental area. Brain Res 864:176–185. (2009) Effects of sustained serotonin reuptake inhibition on the firing of dopamine neurons in the rat ventral tegmental area. J Psychiatry Neurosci 34:223–229. (2012) The genetic basis of addictive disorders. Psychiatr Clin North Am 35:495–519. (2005) WAY-163909 [(7bR, 10aR)-1,2,3,4,8,9,10,10a-octahydro-7bH-cyclopenta-[b][1,4]diazepino[6,7,1hi]indole], a novel 5-hydroxytryptamine 2C receptor-selective agonist with anorectic activity. J Pharmacol Exp Ther 313:862–869. (1997) Pattern of expression of the serotonin2C receptor messenger RNA in the basal ganglia of adult rats. J Comp Neurol 384:233–247. (2008) Modulation of striatal dopamine release by 5-HT2A and 5-HT2C receptor antagonists: [11C]raclopride PET studies in the rat. Psychopharmacology (Berl) 200:487–496. (1998) The pharmacology of impulsive behaviour in rats IV: the effects of selective serotonergic agents on a paced fixed consecutive number schedule. Psychopharmacology (Berl) 140:319–330 Berl. (1999) The pharmacology of impulsive behaviour in rats VI: the effects of ethanol and selective serotonergic drugs on response choice with varying delays of reinforcement. Psychopharmacology (Berl) 146:413–421 Berl. (1996) Failure of ritanserin to block cocaine cue reactivity in humans. Drug Alcohol Depend 42:167–174. (2006) Toward a model of drug relapse: an assessment of the validity of the reinstatement procedure. Psychopharmacology (Berl) 189:1–16. (2002) 3,4-Methylenedioxymethamphetamine (MDMA, “ecstasy”) and its stereoisomers as reinforcers in rhesus monkeys: serotonergic involvement. Psychopharmacology (Berl) 161:356–364. (1990) Serotonin stimulates phospholipase A2 and the release of arachidonic acid in hippocampal neurons by a type 2 serotonin receptor that is independent of inositolphospholipid hydrolysis. Proc Natl Acad Sci USA 87:2187–2191. (2005) Pharmacological properties of the Cys23Ser single nucleotide polymorphism in human 5-HT2C receptor isoforms. Pharmacogenomics J 5:244–254. (2008) Attentional bias in addictive behaviors: a review of its development, causes, and consequences. Drug Alcohol Depend 97:1–20. (2005) Role of serotonin (5-HT)2 receptors in cocaine self-administration and seeking behavior in rats. Pharmacol Rep 57:35–46. (2004) Contribution of serotonin (5-hydroxytryptamine; 5-HT) 5-HT2 receptor subtypes to the hyperlocomotor effects of cocaine: acute and chronic pharmacological analyses. J Pharmacol Exp Ther 310:1246–1254. (2006) Contribution of serotonin (5-HT) 5-HT2 receptor subtypes to the discriminative stimulus effects of cocaine in rats. Psychopharmacology (Berl) 183:482–489. (2003) Hyperlocomotive and discriminative stimulus effects of cocaine are under the control of serotonin(2C) (5-HT(2C)) receptors in rat prefrontal cortex. J Pharmacol Exp Ther 306:734–743. (2012) Pharmacological and genetic interventions in serotonin (5-HT)(2C) receptors to alter drug abuse and dependence processes. Brain Res 1476:132–153. (1990) Pharmacology and therapeutic applications of cocaine. Anesthesiology 73:518–531. (2002) Differential effects of the 5-HT(2A) receptor antagonist M100907 and the 5-HT(2C) receptor antagonist SB242084 on cocaine-induced locomotor activity, cocaine self-administration and cocaine-induced reinstatement of responding. Neuropsychopharmacology 27:576–586. (2011) Impulsive action induced by amphetamine, cocaine and MK801 is reduced by 5-HT(2C) receptor stimulation and 5-HT(2A) receptor blockade. Neuropharmacology 61:468–477. (2008) The 5-HT2C receptor agonist Ro60-0175 reduces cocaine self-administration and reinstatement induced by the stressor yohimbine, and contextual cues. Neuropsychopharmacology 33:1402–1412. (2006) The effects of the 5-HT(2C) receptor antagonist SB242084 on locomotor activity induced by selective, or mixed, indirect serotonergic and dopaminergic agonists. Psychopharmacology (Berl) 187:515–525. (2007) Opposing effects of 5-HT(2A) and 5-HT(2C) receptor antagonists in the rat and mouse on premature responding in the five-choice serial reaction time test. Psychopharmacology (Berl) 195:223–234. (2005) Mechanism of action and therapeutic uses of psychostimulants. Clin Lab Sci 18:107–113. (2004) m-Chlorophenylpiperazine (mCPP) modulates the discriminative stimulus effects of cocaine through actions at the 5-HT2C receptor. Behav Neurosci 118:157–162. (2000) Association between obsessive-compulsive disorder and polymorphisms of genes encoding components of the serotonergic and dopaminergic pathways. Eur Neuropsychopharmacol 10:205–209. (1998) Predictive validity of the extinction/reinstatement model of drug craving. Psychopharmacology (Berl) 135:151–160. (1997) The Prefrontal Cortex: Anatomy, Physiology, and Neuropsychology of the Frontal Lobe, 3rd edition. Lippincott-Raven, Philadelphia. (2000) What we have learned about addiction from animal models of drug self-administration. Am J Addict 9:285–313. (2005) Cellular mechanisms underlying an effect of “early handling” on pCREB and BDNF in the neonatal rat hippocampus. Brain Res 1052:187–195. (2011) Drug Discrimination: Applications to Medicinal Chemistry and Drug Studies, John Wiley and Sons, Hoboken, NJ. (1997) Phentermine/fenfluramine decreases cocaine self-administration in rhesus monkeys. Neuroreport 8:1347–1351. (2000) Serotonin(2C) receptors tonically suppress the activity of mesocortical dopaminergic and adrenergic, but not serotonergic, pathways: a combined dialysis and electrophysiological analysis in the rat. Synapse 36:205–221. (1998) The rate hypothesis and agonist substitution approaches to cocaine abuse treatment. Adv Pharmacol 42:995–997. (2013) Neurophysiological effects of modafinil on cue-exposure in cocaine dependence: a randomized placebo-controlled cross-over study using pharmacological fMRI. Addict Behav 38:1509–1517. (2011) Differential effects of cocaine and MDMA self-administration on cortical serotonin transporter availability in monkeys. Neuropharmacology 61:245–251. (1995) Fluoxetine is ineffective for treatment of cocaine dependence or concurrent opiate and cocaine dependence: two placebo-controlled double-blind trials. J Clin Psychopharmacol 15:163–174. (1996) Activation of memory circuits during cue-elicited cocaine craving. Proc Natl Acad Sci USA 93:12040–12045. (2000) Studies to investigate the role of 5-HT(2C) receptors on cocaine- and food-maintained behavior. J Pharmacol Exp Ther 295:1183–1191. (2010) Mesocorticolimbic circuits are impaired in chronic cocaine users as demonstrated by resting-state functional connectivity. Neuroimage 53:593–601. (2002) Altered editing of serotonin 2C receptor pre-mRNA in the prefrontal cortex of depressed suicide victims. Neuron 34:349–356. (2000) Autoradiographic localization of 5-HT(2A) receptors in the human brain using [(3)H]M100907 and [(11)C]M100907. Synapse 38:421–431. (1989) Serotonin-like immunoreactive cells and fibres in the rat ventromedial mesencephalic tegmentum. Brain Res Bull 22:725–735. (2008) Controversies in translational research: drug self-administration. Psychopharmacology (Berl) 199:403–419. (2013) Recovering from cocaine: insights from clinical and preclinical investigations. Neurosci Biobehav Rev 37 (9 Pt A):2037–2046. (2011) The association between frontal-striatal connectivity and sensorimotor control in cocaine users. Drug Alcohol Depend 115:240–243. (2008) Molecular biology of 5-HT receptors. Behav Brain Res 195:198–213. (2013) DSM-5 criteria for substance use disorders: recommendations and rationale. Am J Psychiatry 170:834–851. (2011) 5-HT receptors and reward-related behaviour: a review. Neurosci Biobehav Rev 35:1419–1449. (2000) Identification of a subpopulation of substantia nigra pars compacta gamma-aminobutyric acid neurons that is regulated by basal ganglia activity. J Comp Neurol 416:30–44. (2011) Relapse prevention for addictive behaviors. Subst Abuse Treat Prev Policy 6:17. (2013) Elevated expression of serotonin 5-HT(2A) receptors in the rat ventral tegmental area enhances vulnerability to the behavioral effects of cocaine. Front Psychiatry 6: 2. (1987) Serotonin axon terminals in the ventral tegmental area of the rat: fine structure and synaptic input to dopaminergic neurons. Brain Res 435:71–83. (1991) Brain perfusion is abnormal in cocaine-dependent polydrug users: a study using technetium-99m-HMPAO and ASPECT. J Nucl Med 32:1206–1210. (1993) Regional cerebral blood flow improves with treatment in chronic cocaine polydrug users. J Nucl Med 34:723–727. (1995) Serotonergic modulation of the behavioral effects of cocaine in the squirrel monkey. J Pharmacol Exp Ther 275:1551–1559. (2014) Monoamine transporter inhibitors and substrates as treatments for stimulant abuse. Adv Pharmacol 69:129–176.
. (2014). Predicting abuse potential of stimulants and other dopaminergic drugs: Overview and recommendations. Neuropharmacology pii: S0028-3908(14)00094-X. (1995) Effect of antidepressants on striatal and accumbens extracellular dopamine levels. Eur J Pharmacol 281:255–261. (2000) Elevated central serotonin transporter binding availability in acutely abstinent cocaine-dependent patients. Am J Psychiatry 157:1134–1140. (1998) 5-Hydroxytryptamine2A serotonin receptors in the primate cerebral cortex: possible site of action of hallucinogenic and antipsychotic drugs in pyramidal cell apical dendrites. Proc Natl Acad Sci USA 95:735–740. (2000) Segregation of serotonin 5-HT2A and 5-HT3 receptors in inhibitory circuits of the primate cerebral cortex. J Comp Neurol 417:337–348. (1989) The pharmacology of cocaine related to its abuse. Pharmacol Rev 41:3–52. (2003) Brain circuitry and the reinstatement of cocaine-seeking behavior. Psychopharmacology (Berl) 168:44–56. (2011) New medications for drug addiction hiding in glutamatergic neuroplasticity. Mol Psychiatry 16:974–986. (2005). Psychiatry, Psychoanalysis, and the New Biology of Mind, 1st ed, American Psychiatric Pub, Washington, DC. (2012) Diversity and modularity of G protein-coupled receptor structures. Trends Pharmacol Sci 33:17–27. (2013) Structure-function of the G protein-coupled receptor superfamily. Annu Rev Pharmacol Toxicol 53:531–556. (2011) Role of serotonin 5-HT2A and 5-HT2C receptors on brain stimulation reward and the reward-facilitating effect of cocaine. Psychopharmacology (Berl) 213:337–354. (2003) The validity of the reinstatement model of craving and relapse to drug use. Psychopharmacology (Berl) 168:21–30. (2001) Neural activity related to drug craving in cocaine addiction. Arch Gen Psychiatry 58:334–341. (2009) Behavioral and neurochemical effects of amphetamine analogs that release monoamines in the squirrel monkey. Pharmacol Biochem Behav 94:278–284. (2011) Contributions of serotonin in addiction vulnerability. Neuropharmacology 61:421–432. (2010) Antagonists and substrates differentially regulate serotonin transporter cell surface expression in serotonergic neurons. Eur J Pharmacol 629:63–67. (1993) Effects of three monoamine uptake inhibitors on behavior maintained by cocaine or food presentation in rhesus monkeys. Drug Alcohol Depend 31:149–158. (2004) Pharmacological characterisation of the agonist radioligand binding site of 5-HT(2A), 5-HT(2B) and 5-HT(2C) receptors. Naunyn Schmiedebergs Arch Pharmacol 370:114–123. (2010) Neurocircuitry of addiction. Neuropsychopharmacology 35:217–238. (1987) The serotoninergic innervation of cerebral cortex: different classes of axon terminals arise from dorsal and median raphe nuclei. Synapse 1:153–168. (2000) The 5-HT(2) receptor activation enhances impulsive responding without increasing motor activity in rats. Pharmacol Biochem Behav 66:729–738. (1995) Effects of acute and repeated administration of antidepressant drugs on extracellular levels of 5-hydroxytryptamine measured in vivo. J Pharmacol Exp Ther 274:866–876. (2005) Neural responses to acute cocaine administration in the human brain detected by fMRI. Neuroimage 28:904–914. (2003) 5-HT 2A receptor stimulation by DOI, a 5-HT 2A/2C receptor agonist, potentiates amphetamine-induced dopamine release in rat medial prefrontal cortex and nucleus accumbens. Brain Res 972:216–221. (1994) Molecular cloning, functional expression, and mRNA tissue distribution of the human 5-hydroxytryptamine2B receptor. Mol Pharmacol 46:227–234. (2008) Physical interaction of calmodulin with the 5-hydroxytryptamine2C receptor C-terminus is essential for G protein-independent, arrestin-dependent receptor signaling. Mol Biol Cell 19:4640–4650. (1995) Identification, expression, and pharmacology of a Cys23-Ser23 substitution in the human 5-HT2c receptor gene (HTR2C). Genomics 27:274–279. (2009a) Serotonin2C receptors in the medial prefrontal cortex facilitate cocaine-induced dopamine release in the rat nucleus accumbens. Neuropharmacology 56:507–513. (2009b) In vivo evidence that constitutive activity of serotonin2C receptors in the medial prefrontal cortex participates in the control of dopamine release in the rat nucleus accumbens: differential effects of inverse agonist versus antagonist. J Neurochem 111:614–623. (2001) Variability of 5-HT2C receptor cys23ser polymorphism among European populations and vulnerability to affective disorder. Mol Psychiatry 6:579–585. (1999) Preclinical research on cocaine self-administration: environmental determinants and their interaction with pharmacological treatment. Neurosci Biobehav Rev 23:717–741. (1994) Gender differences in cerebral perfusion in cocaine abuse: technetium-99m-HMPAO SPECT study of drug-abusing women. J Nucl Med 35:1902–1909. (2002) 5-HT(2A) receptor antagonism potentiates haloperidol-induced dopamine release in rat medial prefrontal cortex and inhibits that in the nucleus accumbens in a dose-dependent manner. Brain Res 947:157–165. (2013) Pattern of distribution of serotonergic fibers to the orbitomedial and insular cortex in the rat. J Chem Neuroanat 48-49:29–45. (2007) Serotonin2C receptor localization in GABA neurons of the rat medial prefrontal cortex: implications for understanding the neurobiology of addiction. Neuroscience 146:1677–1688. (2008) A randomized, double-blind, placebo-controlled trial of long-acting risperidone in cocaine-dependent men. J Clin Psychiatry 69:480–486. (1999) Human striosomes are enriched in 5-HT2A receptors: autoradiographical visualization with [3H]MDL100,907,[125I](+/-)DOI and [3H]ketanserin. Eur J Neurosci 11:3761–3765. (2001a) Regional distribution and cellular localization of 5-HT2C receptor mRNA in monkey brain: comparison with [3H]mesulergine binding sites and choline acetyltransferase mRNA. Synapse 42:12–26. (2001b) Mapping of 5-HT2A receptors and their mRNA in monkey brain: [3H]MDL100,907 autoradiography and in situ hybridization studies. J Comp Neurol 429(4):571-89.Lucki, I. (1998). The spectrum of behaviors influenced by serotonin. Biol Psychiatry 44:151–162. (1998) The spectrum of behaviors influenced by serotonin. Biol Psychiatry 44:151–162. (2010) Addiction related alteration in resting-state brain connectivity. Neuroimage 49:738–744. (1998) Functional magnetic resonance imaging of human brain activation during cue-induced cocaine craving. Am J Psychiatry 155:124–126. (1991) Dual serotoninergic projections to forebrain in the rat: morphologically distinct 5-HT axon terminals exhibit differential vulnerability to neurotoxic amphetamine derivatives. J Comp Neurol 314:558–586. (2012b) The serotonin 2C receptor antagonist SB 242084 exhibits abuse-related effects typical of stimulants in squirrel monkeys. J Pharmacol Exp Ther 342:761–769. (2012a) Effects of serotonin 2C receptor agonists on the behavioral and neurochemical effects of cocaine in squirrel monkeys. J Pharmacol Exp Ther 341:424–434. (2005) The selective 5-HT2A receptor antagonist M100907 enhances antidepressant-like behavioral effects of the SSRI fluoxetine. Neuropsychopharmacology 30:2205–2215. (2013) Error-related brain activity predicts cocaine use after treatment at 3-month follow-up. Biol Psychiatry 73:782–788. (2007) WAY-163909 [(7bR,10aR)-1,2,3,4,8,9,10,10a-octahydro-7bH-cyclopenta-[b][1,4]diazepino[6,7,1hi]indole]: A novel 5-hydroxytryptamine 2C receptor-selective agonist with preclinical antipsychotic-like activity. J Pharmacol Exp Ther 320:486–496. (2013) Modeling relapse in animals. Curr Top Behav Neurosci 13:403–432. (2000) Serotonin transporters upregulate with chronic cocaine use. J Chem Neuroanat 20:271–280. (2008). Drug discovery and development for reward disorders: views from government, in Reward Deficit Disorders, 3rd ed., vol. 3, pp. 23–40, Academic Press, Burlington, VT.
(2002) Phospholipase D activation by endogenous 5-hydroxytryptamine 2C receptors is mediated by Galpha13 and pertussis toxin-insensitive Gbetagamma subunits. Mol Pharmacol 62:1339–1343. (2004) RNA editing of the human serotonin 5-HT2C receptor disrupts transactivation of the small G-protein RhoA. Mol Pharmacol 65:252–256. (2001) Antagonism of 5-hydroxytryptamine(2a) receptors attenuates the behavioral effects of cocaine in rats. J Pharmacol Exp Ther 297:357–363. (2001) Differential regulation of the mesoaccumbens circuit by serotonin 5-hydroxytryptamine (5-HT)2A and 5-HT2C receptors. J Neurosci 21:7781–7787. (1996) Preclinical evaluation of pharmacotherapies for treatment of cocaine and opioid abuse using drug self-administration procedures. Neuropsychopharmacology 14:375–424. (2012) Striatal dopamine release and genetic variation of the serotonin 2C receptor in humans. J Neurosci 32:9344–9350. (2008) Signaling at G-protein-coupled serotonin receptors: recent advances and future research directions. Trends Pharmacol Sci 29:454–464. (2003) Ultrastructural localization of serotonin2A receptors in the middle layers of the rat prelimbic prefrontal cortex. Neuroscience 116:107–117. (1990) Serotonin regulates type II corticosteroid receptor binding in hippocampal cell cultures. J Neurosci 10:1745–1752. (2001a) Psychiatric aspects of impulsivity. Am J Psychiatry 158:1783–1793. (2001b) The impact of impulsivity on cocaine use and retention in treatment. J Subst Abuse Treat 21:193–198. (2007) Citalopram combined with behavioral therapy reduces cocaine use: a double-blind, placebo-controlled trial. Am J Drug Alcohol Abuse 33:367–378. (2012) Increased Orbitofrontal Brain Activation after Administration of a Selective Adenosine A(2A) Antagonist in Cocaine Dependent Subjects. Front Psychiatry 3:44. (2007) Functional selectivity of hallucinogenic phenethylamine and phenylisopropylamine derivatives at human 5-hydroxytryptamine (5-HT)2A and 5-HT2C receptors. J Pharmacol Exp Ther 321:1054–1061. (2013a) Selective serotonin 2A receptor antagonism attenuates the effects of amphetamine on arousal and dopamine overflow in non-human primates. J Sleep Res 22:581–588. (2013b) Serotonin 2A receptors differentially contribute to abuse-related effects of cocaine and cocaine-induced nigrostriatal and mesolimbic dopamine overflow in nonhuman primates. J Neurosci 33:13367–13374. (2011) Presynaptic control of serotonin on striatal dopamine function. Psychopharmacology (Berl) 213:213–242. (2004) In vivo evidence that 5-HT2C receptor antagonist but not agonist modulates cocaine-induced dopamine outflow in the rat nucleus accumbens and striatum. Neuropsychopharmacology 29:319–326. (2006) Clozapine and haloperidol differentially alter the constitutive activity of central serotonin2C receptors in vivo. Biol Psychiatry 59:568–575. (2008) Differential regulation of the mesoaccumbens dopamine circuit by serotonin2C receptors in the ventral tegmental area and the nucleus accumbens: an in vivo microdialysis study with cocaine. Neuropsychopharmacology 33:237–246. (2008) The 5-HT(2C) receptor agonist WAY-163909 decreases impulsivity in the 5-choice serial reaction time test. Behav Brain Res 188:412–415. (2007) Monoamine releasers with varying selectivity for dopamine/norepinephrine versus serotonin release as candidate “agonist” medications for cocaine dependence: studies in assays of cocaine discrimination and cocaine self-administration in rhesus monkeys. J Pharmacol Exp Ther 320:627–636. (2007). Stimulation of 5-HT2C receptors attenuates cue and cocaine-primed reinstatement of cocaine-seeking behavior in rats. Behav Pharmacol 18:791–800. (2001) Risperidone pre-treatment reduces the euphoric effects of experimentally administered cocaine. Psychiatry Res 102:227–233. (2009) Blockade of the serotonin 5-HT2A receptor suppresses cue-evoked reinstatement of cocaine-seeking behavior in a rat self-administration model. Behav Neurosci 123:382–396. (2002) Localization of 5-HT(2A) receptors on dopamine cells in subnuclei of the midbrain A10 cell group. Neuroscience 111:163–176. (2006) Involvement of a polymorphism in the 5-HT2A receptor gene in impulsive behavior. Psychopharmacology (Berl) 187:30–35. (2006) Drug addiction and drug abuse, in Goodman and Gilman's The Pharmacological Basis of Therapeutics, 11th ed. (Brunton L, Lazo J, and Parker K eds) pp 607–628, McGraw-Hill, New York. (2004) Modification of human 5-HT(2C) receptor function by Cys23Ser, an abundant, naturally occurring amino-acid substitution. Mol Psychiatry 9:55–64. (2012) Sertraline delays relapse in recently abstinent cocaine-dependent patients with depressive symptoms. Addiction 107:131–141. (1987) Applications and limitations of the drug discrimination method for the study of drug abuse, in Methods of Assessing the Reinforcing Properties of Abused Drugs (Bozarth MJ, ed, ed) pp 291–340, Springer Verlag, New York. (2007) Self-administration of drugs in animals and humans as a model and an investigative tool. Addiction 102:1863–1870. (1981) Organization of ascending serotonin systems in the adult rat brain. A radioautographic study after intraventricular administration of [3H]5-hydroxytryptamine. Neuroscience 6:115–138. (1999) Distribution and cellular localization of the serotonin type 2C receptor messenger RNA in human brain. Neuroscience 92:601–611. (2001) M100,907, a selective 5-HT(2A) antagonist, attenuates dopamine release in the rat medial prefrontal cortex. Brain Res 888:51–59. (2006) Evidence for the preferential involvement of 5-HT2A serotonin receptors in stress- and drug-induced dopamine release in the rat medial prefrontal cortex. Neuropsychopharmacology 31:265–277. (2013) Impact of serotonin (5-HT)2C receptors on executive control processes. Neuropsychopharmacology 38:957–967. (2010) Stimulation of medial prefrontal cortex serotonin 2C (5-HT(2C)) receptors attenuates cocaine-seeking behavior. Neuropsychopharmacology 35:2037–2048. (1992) Effect of fluoxetine on serotonin and dopamine concentration in microdialysis fluid from rat striatum. Life Sci 50:1683–1690. (1994) Actions of 5-hydroxytryptamine on ventral tegmental area neurons of the rat in vitro. Brain Res 654:324–330. (2012) Rational development of addiction pharmacotherapies: successes, failures, and prospects. Cold Spring Harb Perspect Med 2:a012880. (1998) A genetic switch for long-term memory. C R Acad Sci III 321:91–96. (2011) Blockade of 5-HT2A receptors in the medial prefrontal cortex attenuates reinstatement of cue-elicited cocaine-seeking behavior in rats. Psychopharmacology (Berl) 213:307–320. (1994) Distribution of the serotonin 5-HT2 receptor family mRNAs: comparison between 5-HT2A and 5-HT2C receptors. Brain Res Mol Brain Res 23:163–178. (2002) 5-HT2A and 5-HT2C/2B receptor subtypes modulate dopamine release induced in vivo by amphetamine and morphine in both the rat nucleus accumbens and striatum. Neuropsychopharmacology 26:311–324. (1999) Functional characterization of agonists at recombinant human 5-HT2A, 5-HT2B and 5-HT2C receptors in CHO-K1 cells. Br J Pharmacol 128:13–20. (2009) Pharmacokinetics and pharmacodynamics of norfluoxetine in rats: Increasing extracellular serotonin level in the frontal cortex. Pharmacol Biochem Behav 92:469–473. (1985) Glucose metabolic rate kinetic model parameter determination in humans: the lumped constants and rate constants for [18F]fluorodeoxyglucose and [11C]deoxyglucose. J Cereb Blood Flow Metab 5:179–192. (1987) Cocaine receptors on dopamine transporters are related to self-administration of cocaine. Science 237:1219–1223. (2003) Selective interaction of ARF1 with the carboxy-terminal tail domain of the 5-HT2A receptor. Mol Pharmacol 64:1239–1250. (2002) Enhanced locomotor, reinforcing, and neurochemical effects of cocaine in serotonin 5-hydroxytryptamine 2C receptor mutant mice. J Neurosci 22:10039–10045. (2007) Pharmacological profile of the alpha4beta2 nicotinic acetylcholine receptor partial agonist varenicline, an effective smoking cessation aid. Neuropharmacology 52:985–994. (2000) Evidence for possible involvement of 5-HT(2B) receptors in the cardiac valvulopathy associated with fenfluramine and other serotonergic medications. Circulation 102:2836–2841. Rothman RB, Blough BE, Woolverton WL, Anderson KG, Negus SS, Mello NK, Roth BL, and Baumann MH (2005). Development of a rationally designed, low abuse potential, biogenic amine. J Pharmacol Exp Ther 313:1361–1369. (2010) Attenuation of cocaine-induced reinstatement of drug seeking in squirrel monkeys: kappa opioid and serotonergic mechanisms. Psychopharmacology (Berl) 210:169–177. (2004) Expression of serotonin1A and serotonin2A receptors in pyramidal and GABAergic neurons of the rat prefrontal cortex. Cereb Cortex 14:1100–1109. (2012) Neurobiological changes mediating the effects of chronic fluoxetine on cocaine use. Neuropsychopharmacology 37:1816–1824. (1997). Serotonergic modulation of the discriminative-stimulus effects of cocaine in squirrel monkeys. Psychopharmacology (Berl) 132:27–34. (2000) Effects of the serotonin 5-HT(2) antagonist, ritanserin, and the serotonin 5-HT(1A) antagonist, WAY 100635, on cocaine-seeking in rats. Pharmacol Biochem Behav 67:363–369. (2010) Serotonin, but not N-methyltryptamines, activates the serotonin 2A receptor via a ß-arrestin2/Src/Akt signaling complex in vivo. J Neurosci 30:13513–13524. (2008) Agonist-directed signaling of the serotonin 2A receptor depends on beta-arrestin-2 interactions in vivo. Proc Natl Acad Sci USA 105:1079–1084. (2009) Baseline neurocognitive profiles differentiate abstainers and non-abstainers in a cocaine clinical trial. J Addict Dis 28:250–257. (1988) Relationship between the discriminative stimulus properties and subjective effects of drugs. Psychopharmacol Ser 4:161–175. (2000) Serotonin-2C and serotonin-1A receptor genes are not associated with psychotic symptomatology of mood disorders. Am J Med Genet 96:161–166. (2009) Effects of chronic administration of drugs of abuse on impulsive choice (delay discounting) in animal models. Behav Pharmacol 20:380–389. (2011) Synthesis and evaluation of dimeric derivatives of 5-HT(2A) receptor (5-HT(2A)R) antagonist M-100907. ACS Chem Neurosci 2:640–644.